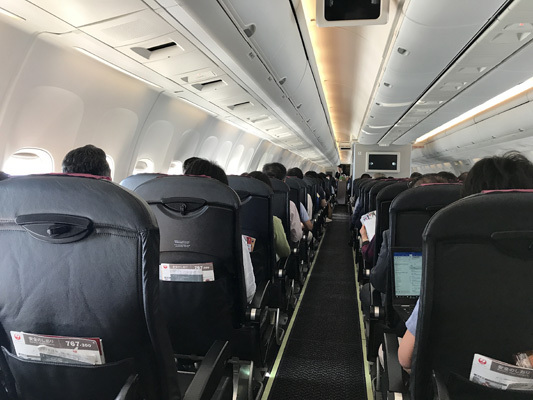 Japan Airlines reminds me of what ideal air travel should be. 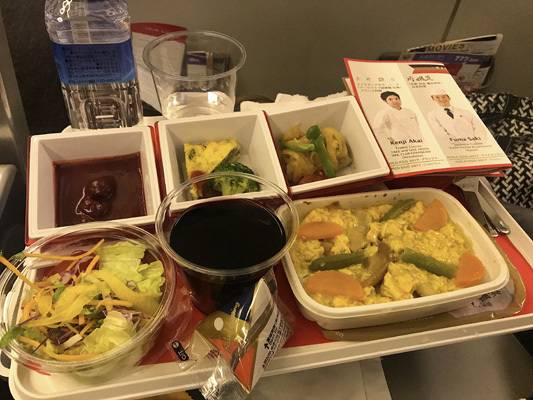 The people at the check-in counter pleasantly smile, the flight attendants are spectacular at service, the food is good and economy seats have the leg room of Business Class. 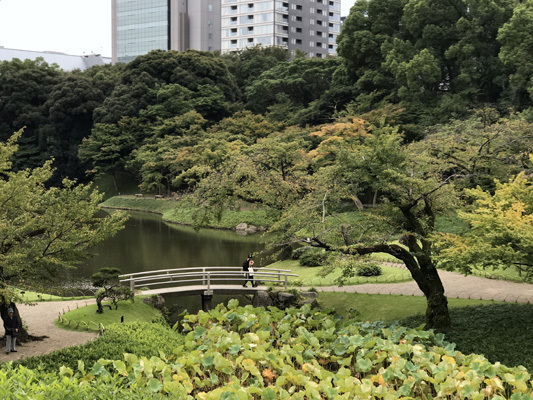 There is always something so serene and peaceful about Japanese Gardens, and Koishikawa-Kōrakuen Gardens was absolutely no different. 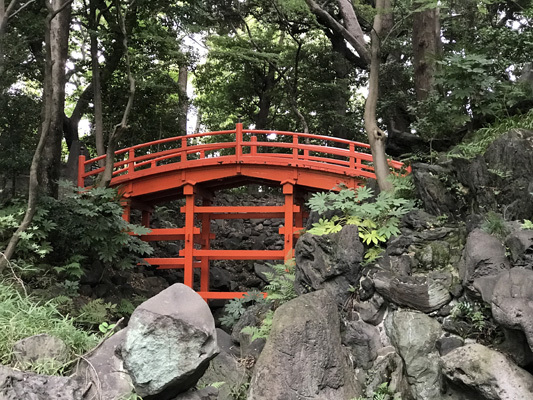 My favorite part was how lush and green this garden was, but then the network of trails would lead to a beautiful red Japanese-style bridge or stone walkway through a pretty pond. I knew from the moment we walked into Waraku it would be special. 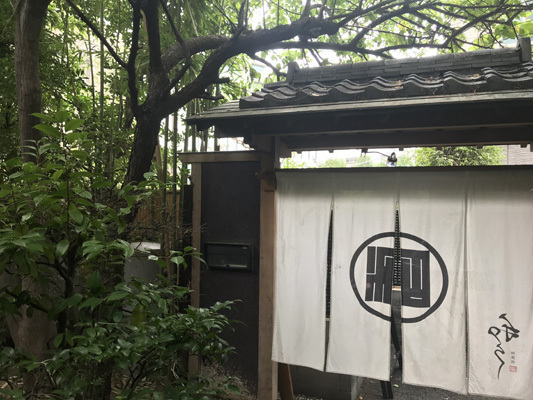 Hidden down a discreet alleyway and floors that were lined with tatami mat floors made the experience even more authentic.My favorite was being able to try the expertly prepared blowfish. 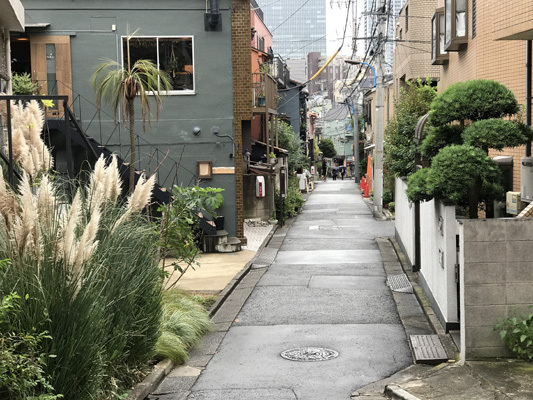 I really enjoyed walking through the narrow alleyways and the street-lined shops in Kagurazaka. Stopping at the tea shop and seeing how many varieties there are was such a treat. 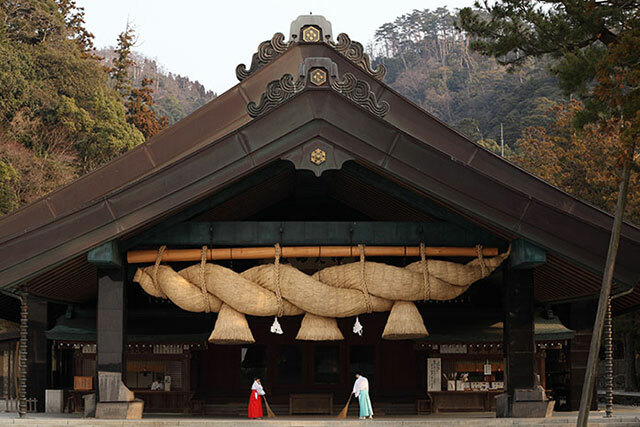 Also, a stop at Akagi Shrine is a must to see how modern architecture mixes with old Japanese tradition. 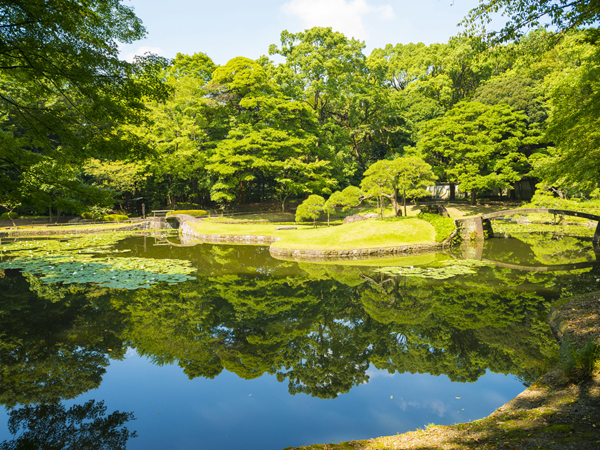 The Koishikawa Korakuen Gardens are beautiful and peaceful. 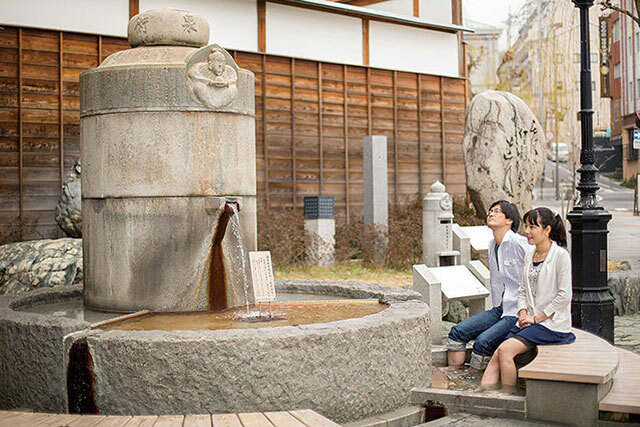 It's a perfect for a short rest, with lots of Kyoto landmark recreated right here in Tokyo! 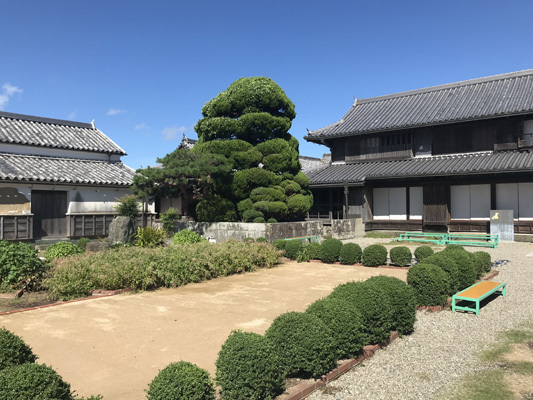 An inner courtyard called "uchiniwa" particularly has a nice lily pond with benches to sit. This spot would be beautiful in the fall with leaves changing colors. 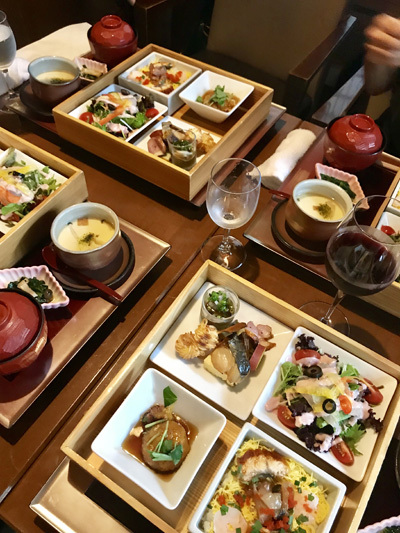 Here, we enjoyed the fresh autumn bento for lunch at "Waraku". The food and the atmosphere were a perfect match with the park. 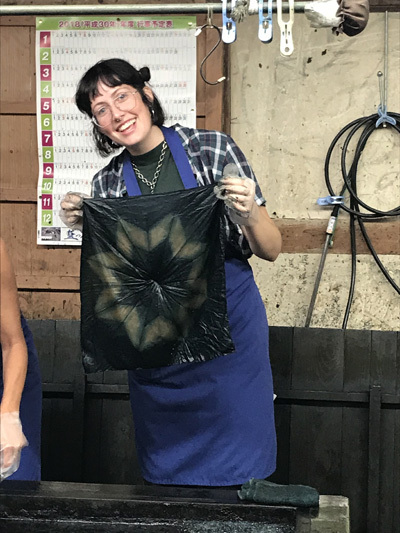 My favorite fact of the day was that a blowfish has to be prepared by a licensed chef, and the garbage has to be collected especially by a specific garbage man, because the extracted poison could kill someone! 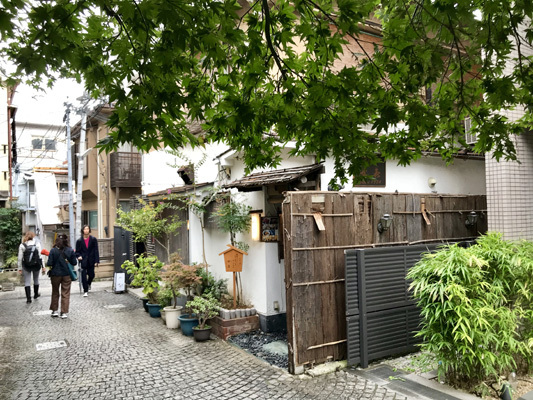 Here at the area of Kagurazaka, you can feel the blend of traditional and modern Japan. 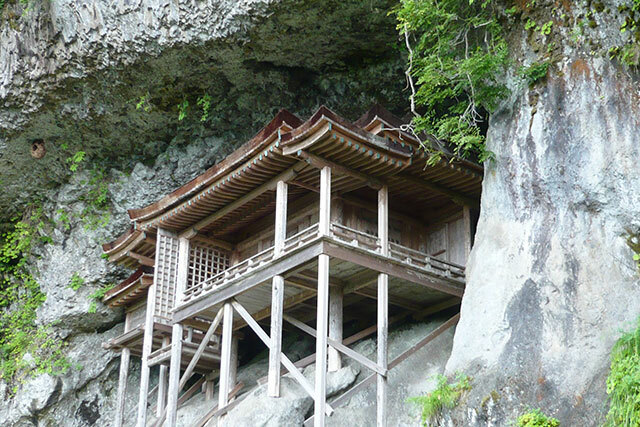 It even hosts the Akagi Jinja, a shrine designed by Kengo Kuma. 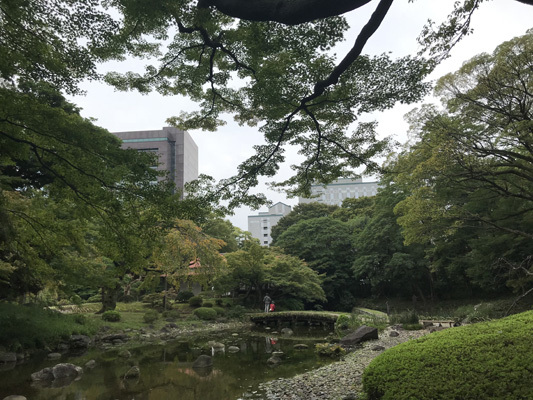 The area formerly known as "flower town" used to be full of tea houses and geisha - come here to watch history and present meet! 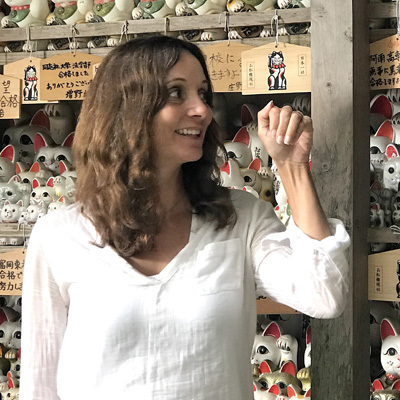 In Tokyo, it’s an interesting and wonderful attraction that can give you a good taste of a unique experience. 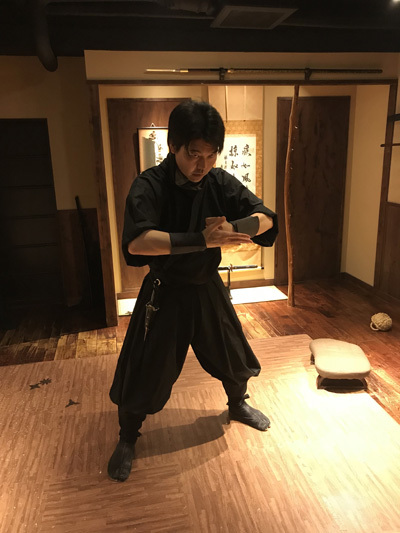 Plus, I learned the difference between a ninja and a samurai, and got to try my hand at hitting the bulls-eye while throwing a ninja star. This spot is a great choice for families. English is written which was very useful. 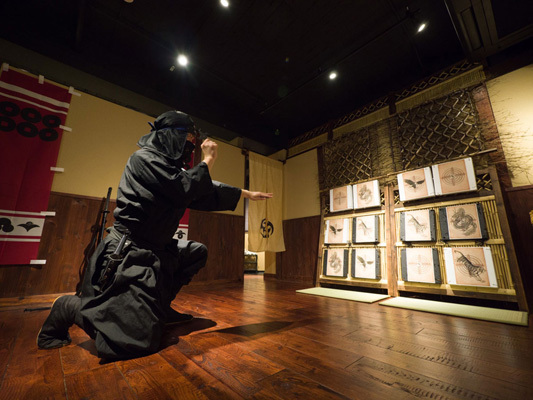 This activity would pair nicely with the Samurai Museum just down the road as well! 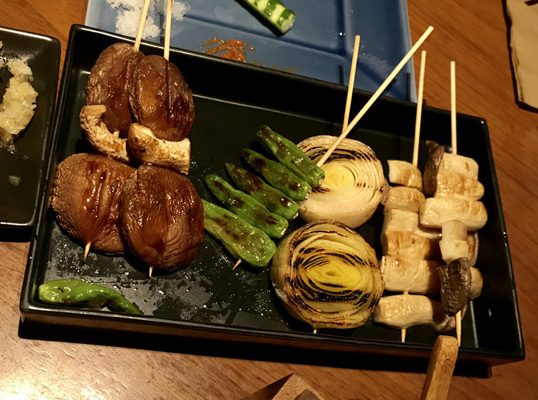 Roji is not what you'd expect from an Izakaya, but that's what made it so interesting. 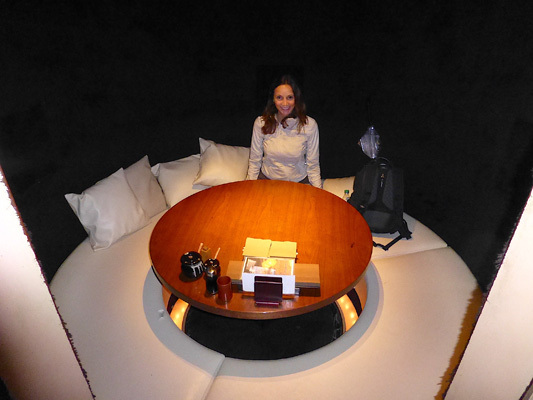 We sat in a private, dark circular room with comfortable cushioned seats. 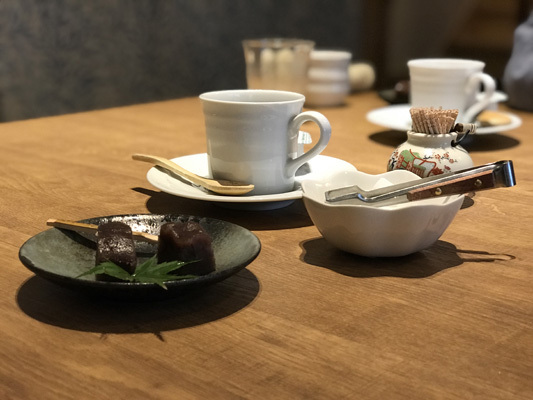 We had a wonderful sampling of what they had to offer, sharing everything izakaya-style, and my favorite was the Age dashi tofu with ground daikon. The lightly deep-fried tofu melted in my mouth! Kabukicho is the gritty entertainment district of Shinjuku with flashing neon lights, 24-hour bars and a large godzilla sitting high atop a skyscraper overlooking it all. 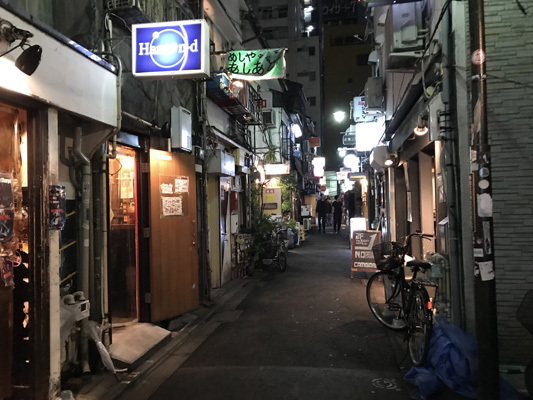 I can't get enough of the narrow alleyways of Golden Gai, the section that has over 300 tiny little bars. 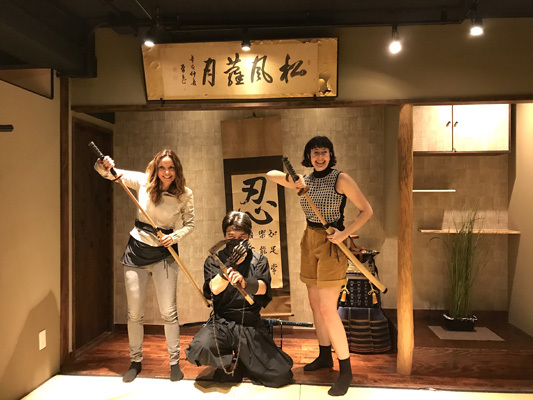 This Izakaya in Shinjuku had an atmosphere unmatched by any other! Black walls, high ceilings, and an all around lush vibe shouldn't fool you - the prices here are still reasonable enough for a night of drinking and delicious food with friends. 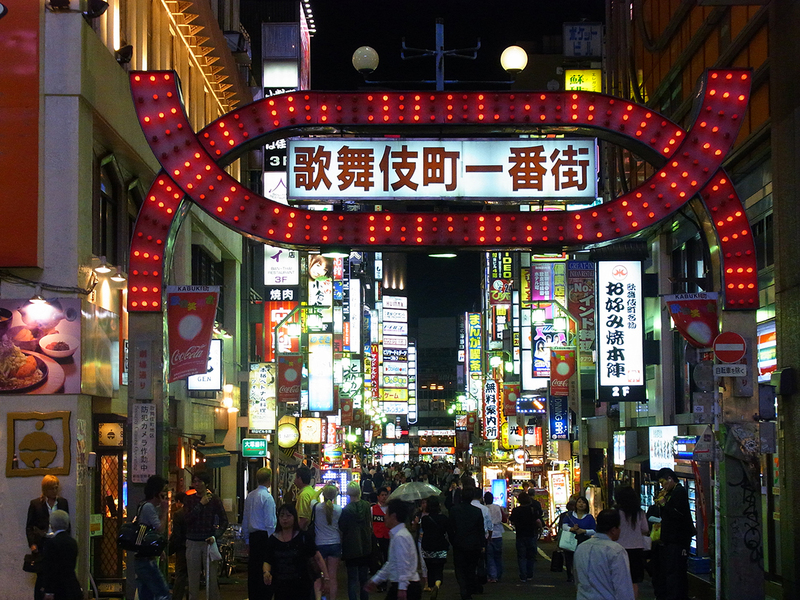 Kabukicho is simply a staple of Tokyo's night life. 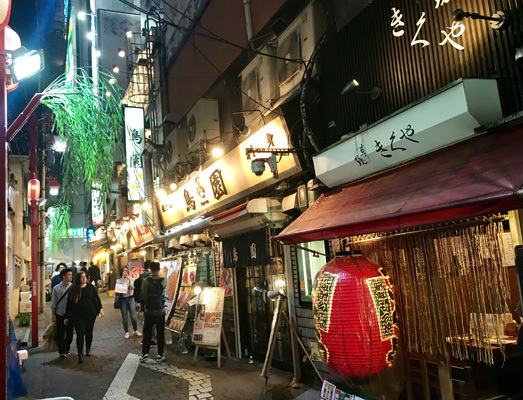 This is the ultimate spot to wander the twinkly and totally packed alleyways that overflow with small bars and big energy every evening. 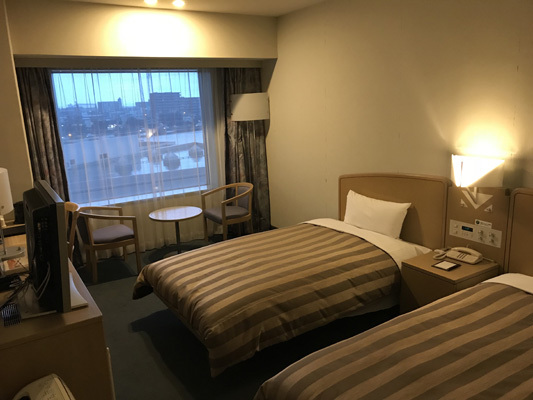 The Shinjuku Prince Hotel was conveniently located right in the heart of all the action of Shinjuku. 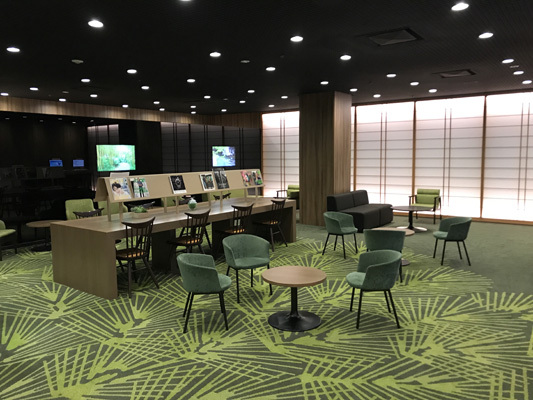 It's sleek and modern interior was appealing, especially in the green lounge area. Breakfast buffet had a lot of choices that were both Japanese and western. 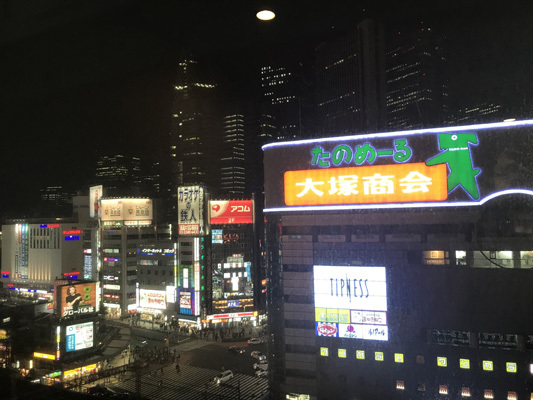 The view from Shinjuku Prince Hotel was incredible. It's a lovely place to just lay in bed and watch the people scatter across the crosswalk after a long day of sightseeing and new experiences. 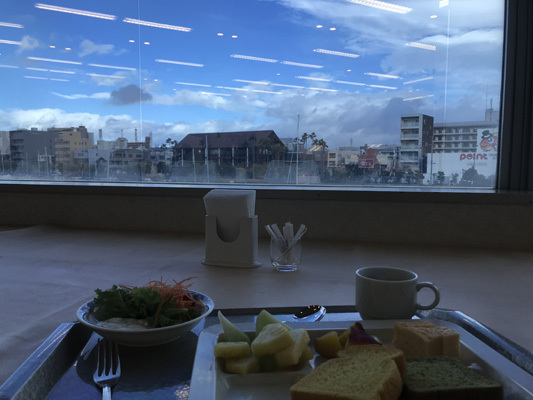 The breakfast buffet offers traditional Japanese breakfast as well as western style. 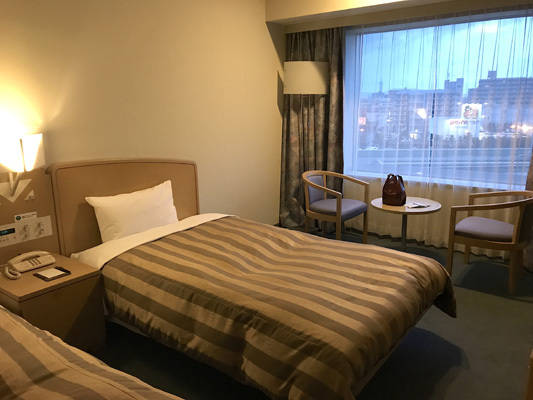 This is a high recommendation for American travelers who are used to larger hotels.The staff also speak English well, and the location is right in the heart of Tokyo. 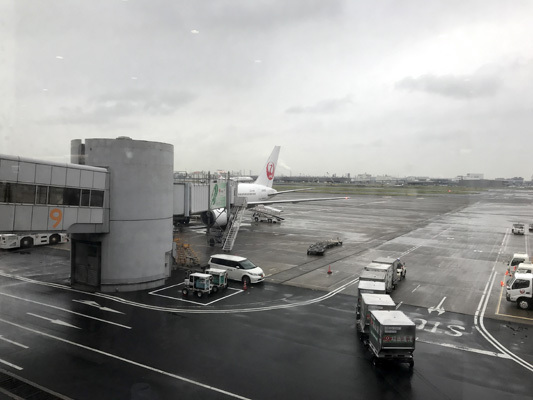 The flight from Tokyo to Tokushima was just over an hour—quick and easy! 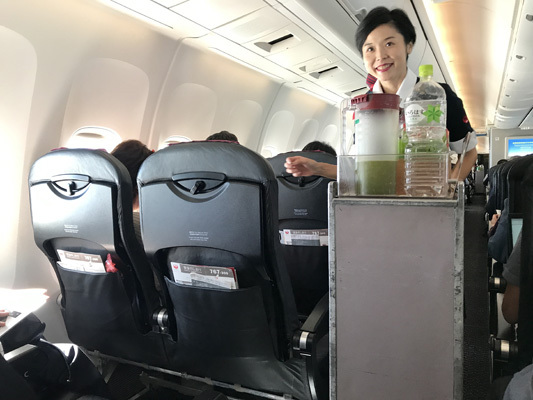 It was a short flight, but they still managed to do a quick beverage service where I drank a refreshing green tea. Plus, even though it was a domestic flight, my checked bag was free of charge. 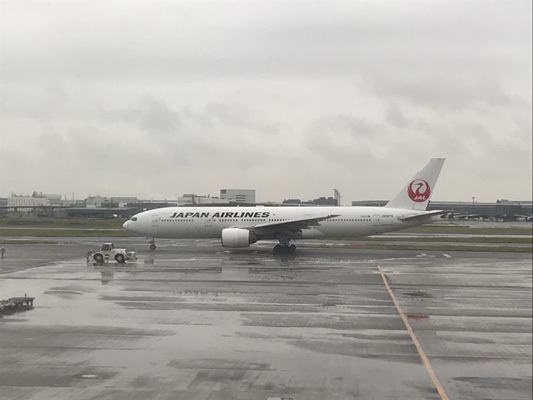 JAL never fails to make flying a time to relax. 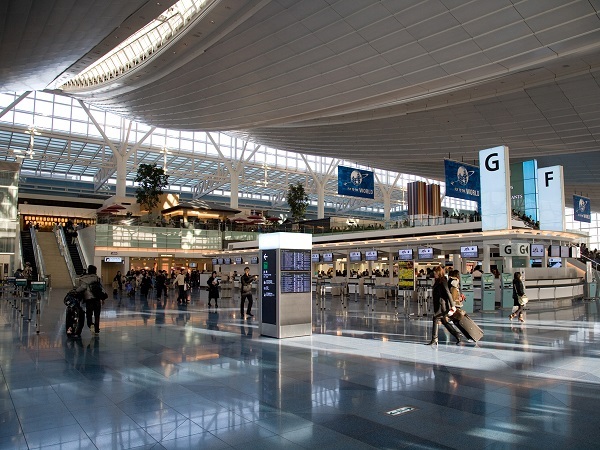 Both in the airport and on the flight, staff are friendly and helpful. 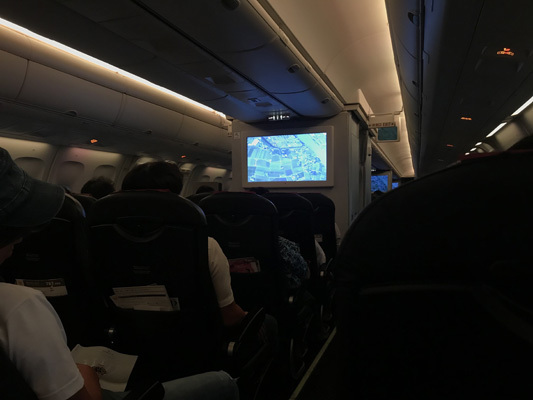 Even on a short flight like this it's a calm atmosphere to rest before you arrive at your next exciting destination! 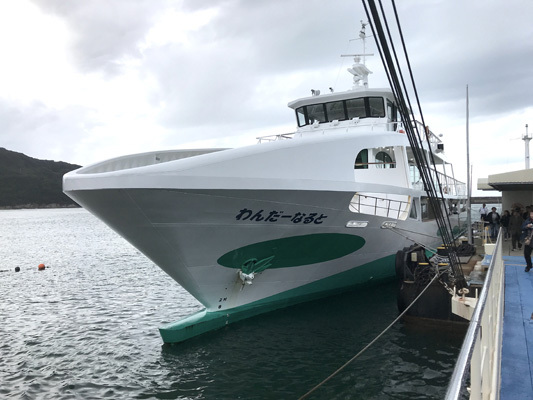 In addition to 11 return flights daily between Tokushima and Tokyo, the airport increased their one daily return flight to two return flights daily between Tokushima and Fukuoka from March 25, 2018. 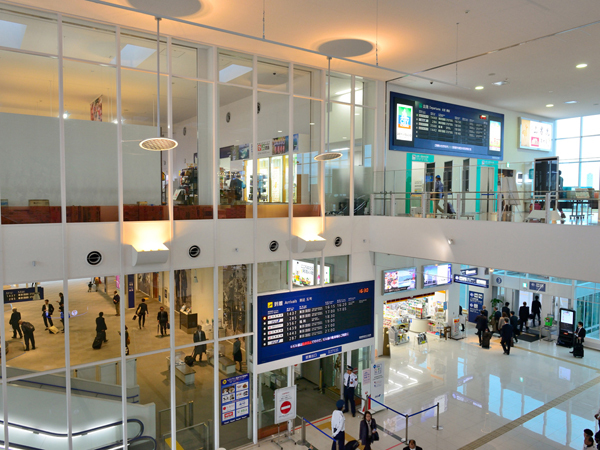 With the opening of a new international terminal on January 21, 2018, it also offers service to international routes. 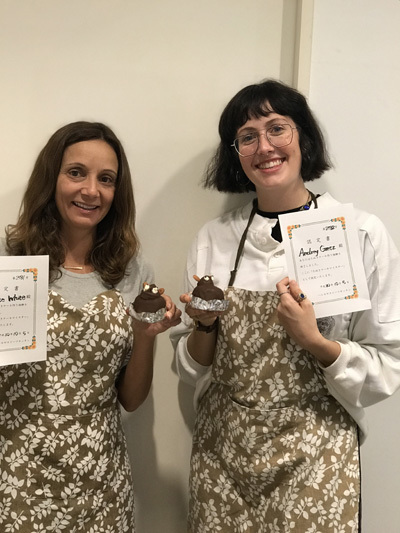 Hallelujah Sweets Kitchen takes you behind the scenes of their delicious factory to learn about the history and see how some of their most popular products are made (there are even samples!). But, the best part was the hands on experience of making my own tanuki character. My chocolate covered raccoon was a bit lopsided but I was still awarded a certificate of completion. 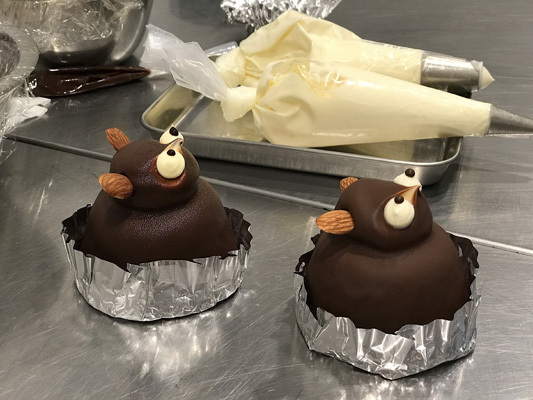 The first thing I noticed about the Hallelujah Sweets Kitchen is its adorable Tanuki mascot! 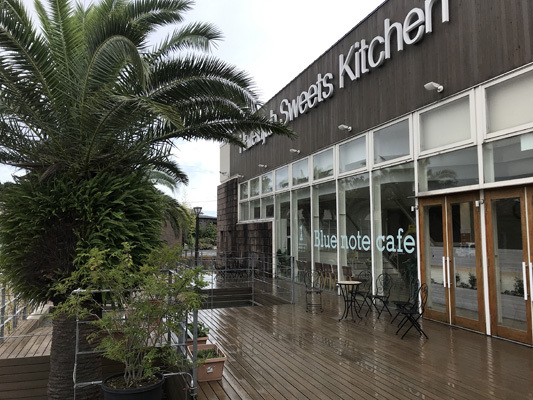 If there is one place you try traditional sweets in Tokushima, this has to be the place! 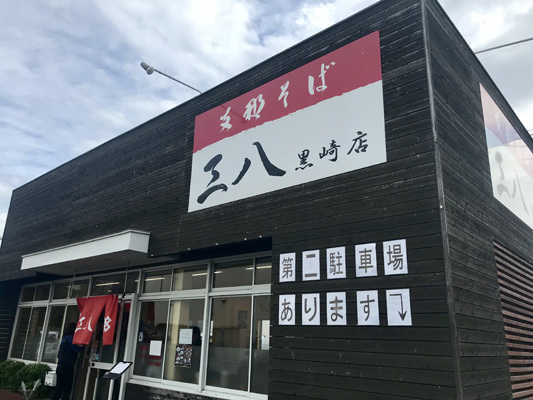 The top selling product is Kincho Manjyu, famous throughout the area. 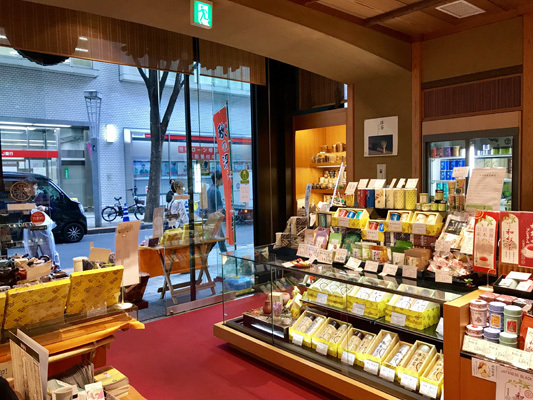 If you are looking for souvenirs, it definitely has you covered here with a variety of beautiful wrapped goods to take home! 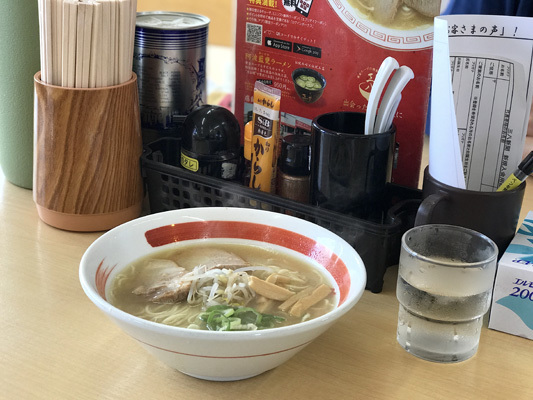 Tokushima Sampa Ramen is a fast food place where you will see dozens of workers lining the seats at noon. A size small (which was actually quite large) costs about $6.00 and was one of the bests one I ever had. 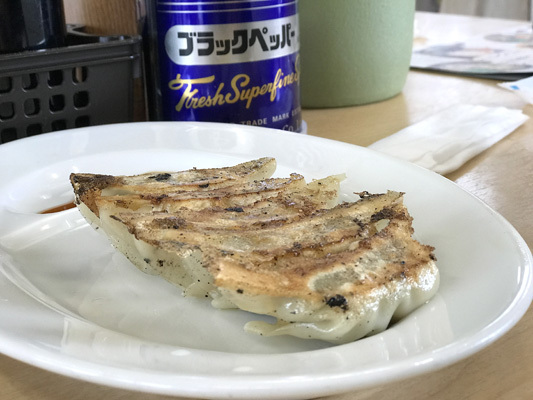 We also ordered a plate of gyoza which were crunchy on the outside, just how I like them! 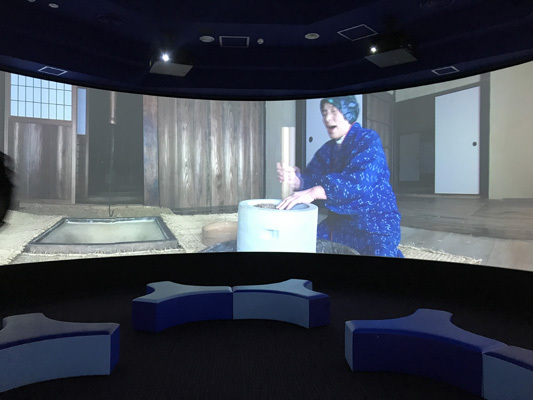 The Uzunomichi Eddy interactive museum makes it fun to learn about whirlpools. The best part was being able to "play the eddy". 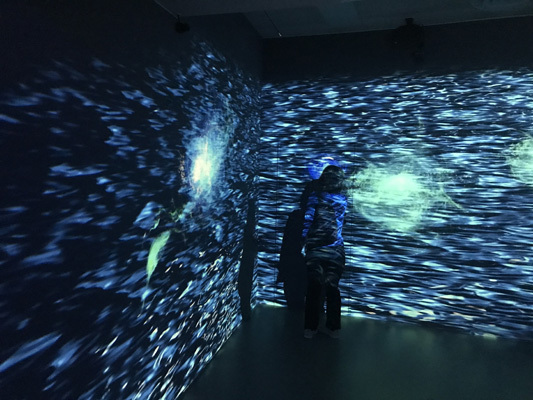 In this room you create the illusion of a whirlpool just by touching the wall. With each touch a small round eddy appears, making the room come alive. 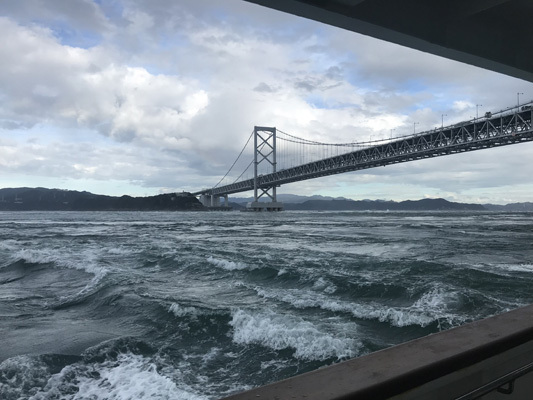 This Naruto Whirlpool happens under the stunning Ohnaruto Bridge, so the best way to see it is by boat. We took the half hour round-trip ride and anxiously waited for a whirlpool to appear. Because this natural phenomenon can be a hit or miss, be patient and if you don’t see it the first time, try again! 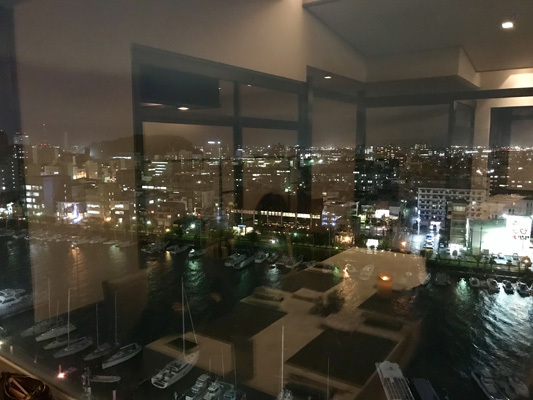 Dinner was on the 14th floor of the Grand V Rio Hotel, overlooking the boats in the harbor below. 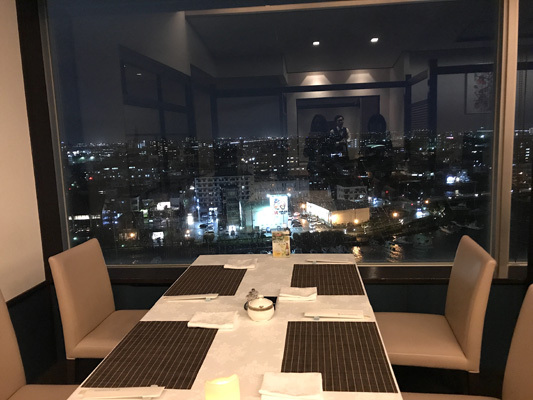 It was a fancy dinner with white tableclothes and a beautiful view! We were served chicken with a trio of sauces for dipping. 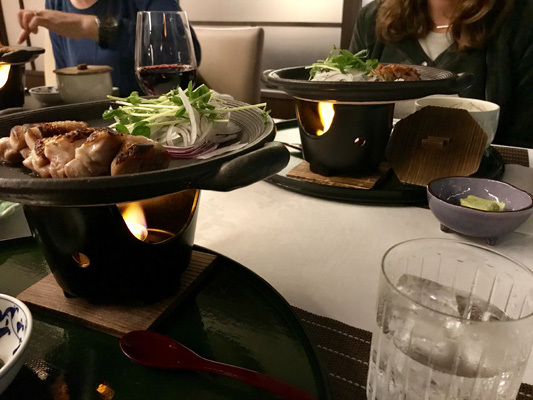 We were able to cook the meat ourselves on a tabletop burner, which added to the experience. 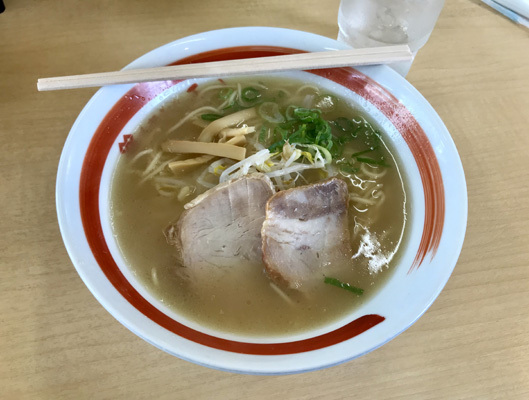 Tokushima Sampa Ramen was incredible! I ate this bowl so quickly that when I looked down I wondered where all my noodles went! 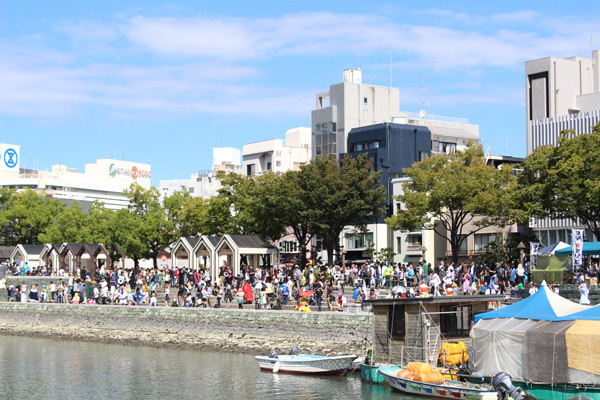 At only about $6.00 and a comfortable everyday atmosphere, this is a popular spot for tourists and busy businessmen alike. 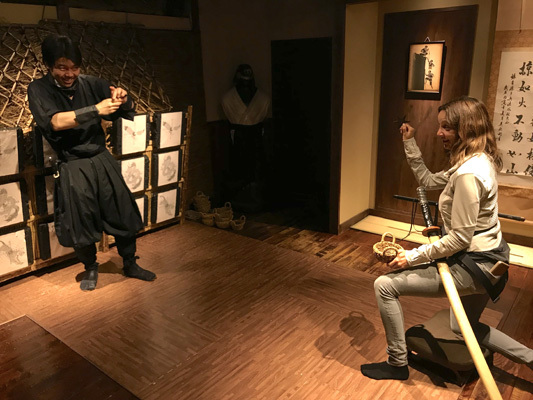 The Uzunomichi Eddy interactive museum is built to lead you throughout in the shape of a winding and twisting whirlwind! 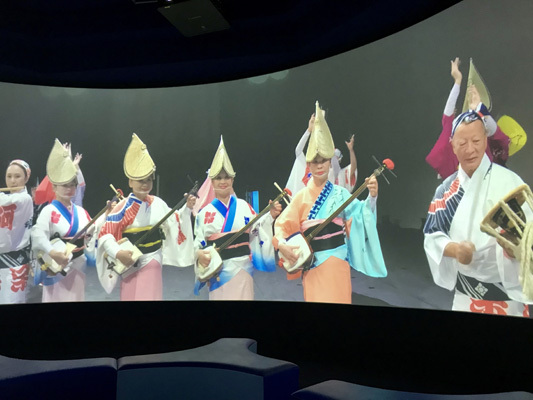 The 360 degree video room begins the tour with a surreal experience of Tokushima culture. 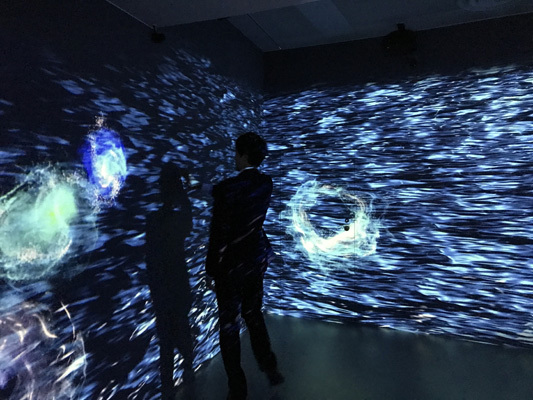 Learning along the way through 3D activities and simulations, you find yourself at the end of the tour, ready for real-life whirlpool spotting! 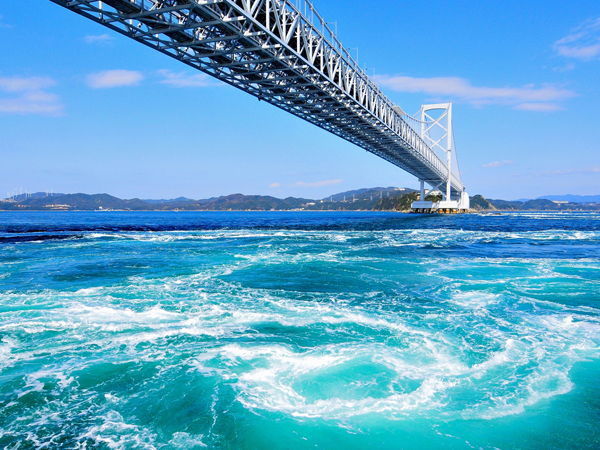 Before you spot any whirlpools, you will spot the gorgeous Onaruto Bridge. 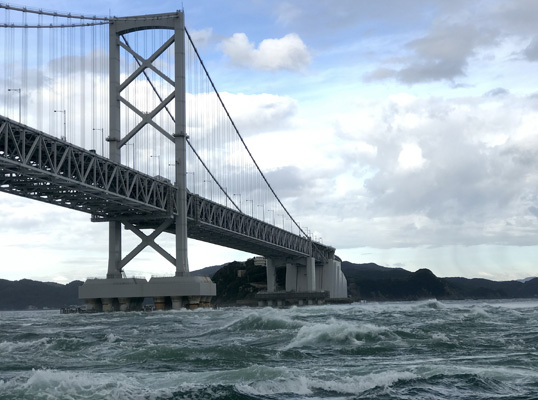 Beneath this bridge is where most whirlpools form! As the boat sets sail everyone's energy rises along with the crashing waves. 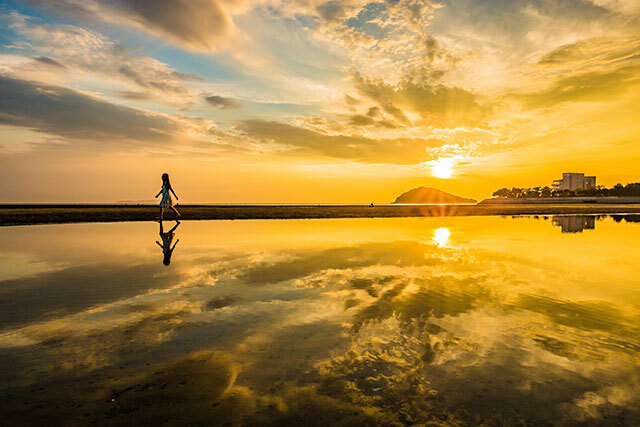 My recommendation - take your camera and enjoy the stunning trip either way! The Grand V Rio Hotel's restaurant boasts a fourteen story view with relaxing atmosphere. Whether you are dressed for a night out or had a long day of sight-seeing, the scenery and delicious food here make for a great meal. One of the recommendations here is the Teppanyaki, which they cook the meat in front of you on a hot plate! 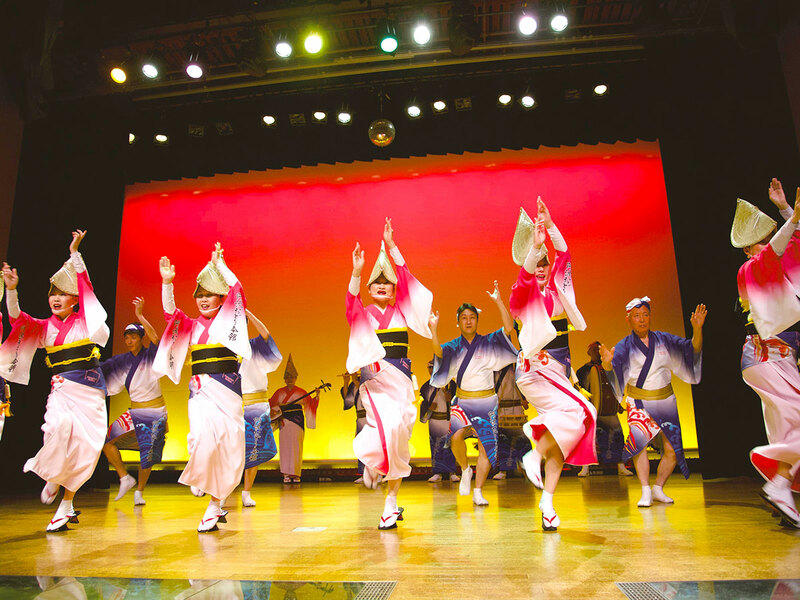 The show at Awa Odori had lively music that had me moving my feel in my chair. 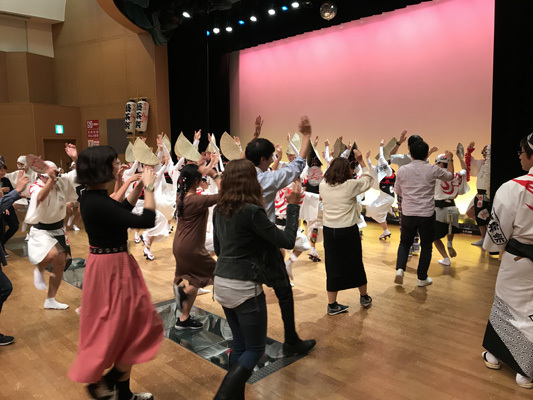 They asked the audience to come on stage and learn the gejaraku dance and of course I had to give it a try. 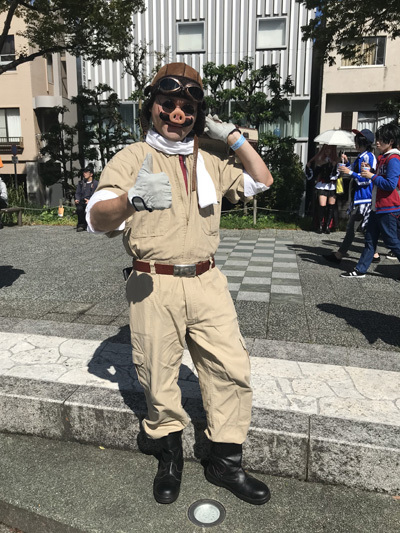 It was easy and fun! 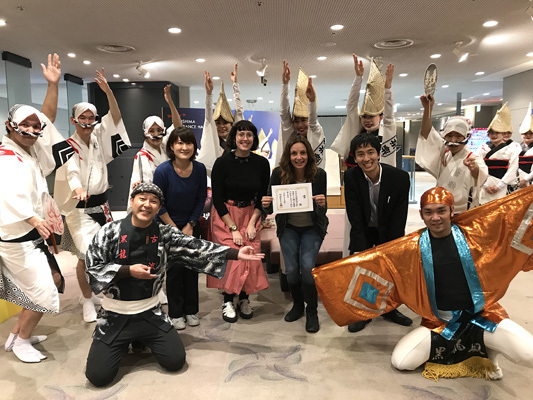 Plus, they awarded me with the best dancer certificate with a Japanese fan as the prize. This performance will get even the quietest person tapping their feet and moving along! 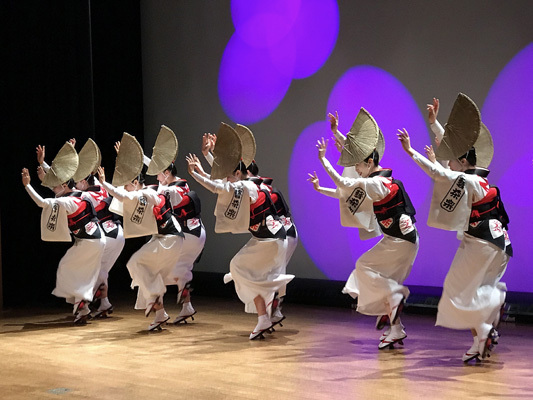 Different performance groups perform here on a rotating schedule, and every single one brings an unstoppable energy and display of traditional culture. Don't be surprised if the host asks you to the front to join the dancers at one point or another! The room at Grand V Rio Hotel was nice, but not too formal so you could truly feel comfortable. 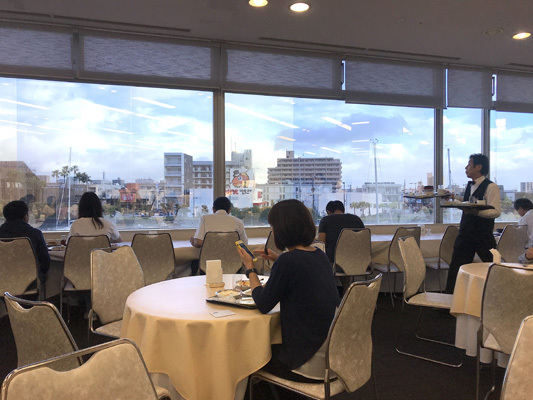 The breakfast buffet had a very large selection of both western and Japanese food.And the view from the breakfast buffet was overlooking the harbor. 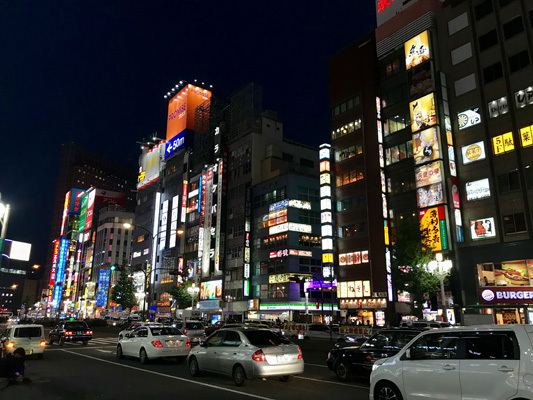 The location is very convenient, there's even a convenience store immediately in front of the hotel. 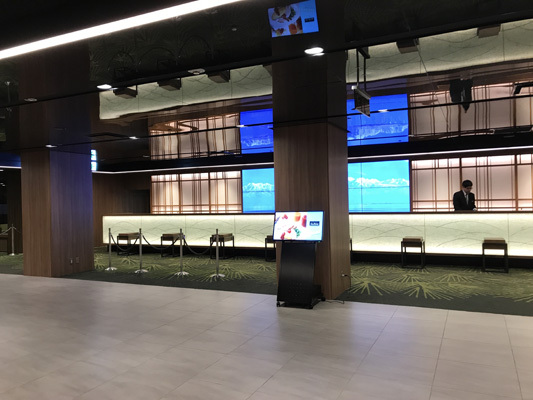 Inside the Grand V Rio Hotel, you will find that it is surprisingly spacious with lovely decor. 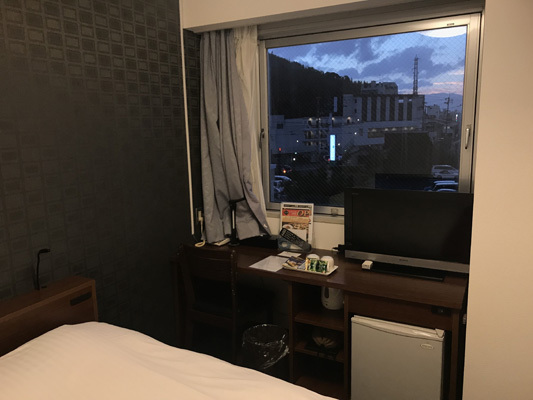 The rooms are large as well with a beautiful view of the city beneath you. 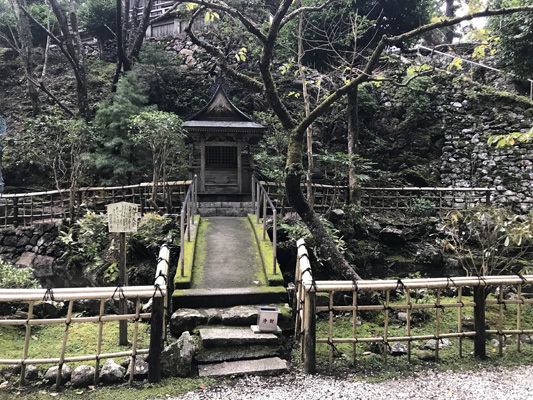 Ryōzen-ji was a beautiful temple where we were able to feed the fish, ring the temple bell and also pick a wish from the box. 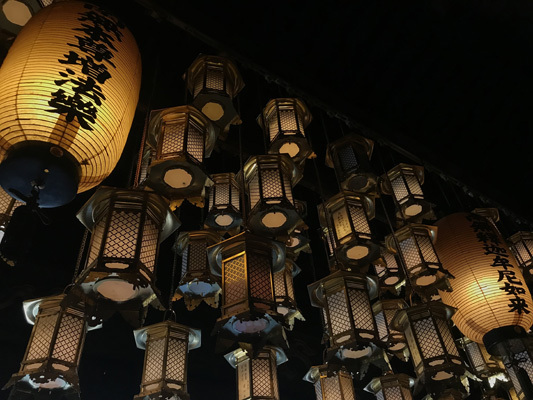 Mine was a "lessor good fortune", which I left at the temple tied to a tree in hopes that the lessor fortune would not come true. 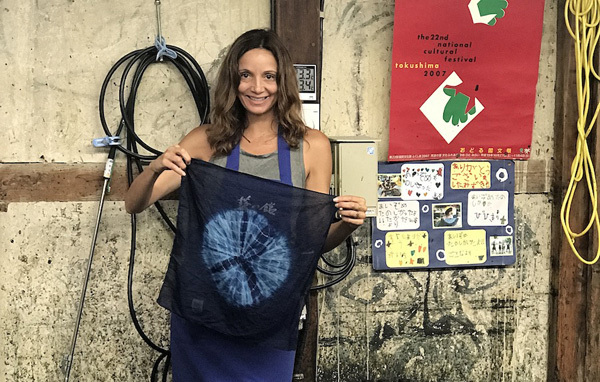 At the Aizumicho Historical Museum I was able to make my own indigo blue hankerchief. We were able to select from several different patterns, I chose a pretty starburst. 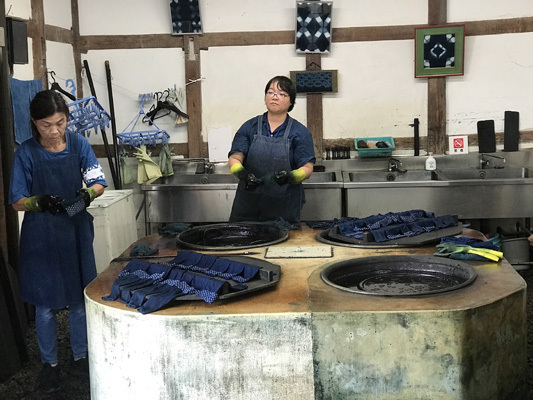 They then assisted me in tying rubberbands around the cloth in just the right way so after it was dunked in the dye it would have the pattern I desired. The finished product was a great souvenir! 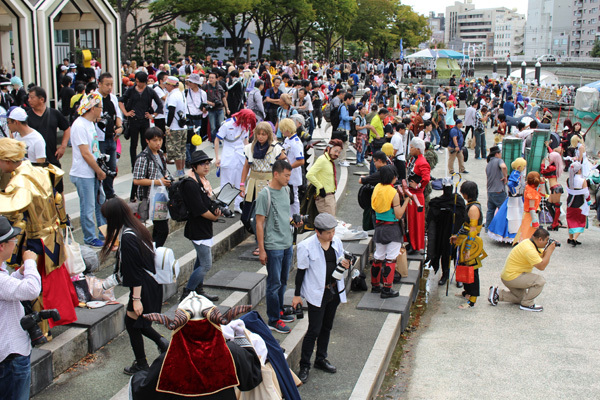 The Anime Festival was a great peek into the cosplay culture of Japan. 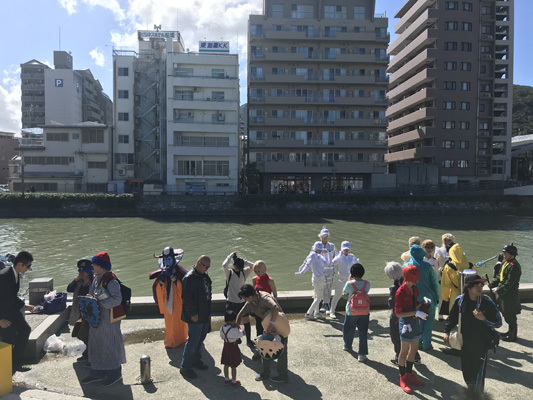 It happened right along the river and there were dozens of people dressed up as different animation characters, many that I have never seen before! 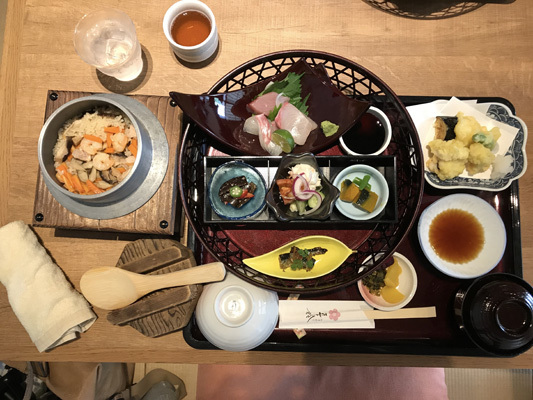 Lunch at Awa Kappo Isuzu may have been the most beautiful meal I have ever seen with lots of choices. 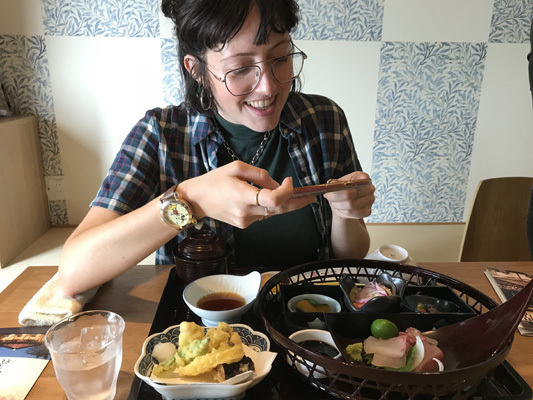 There was eggplant tempura, pumpkin, sea bream fish, sardines and so much more. The setting of lunch was as pretty as food. 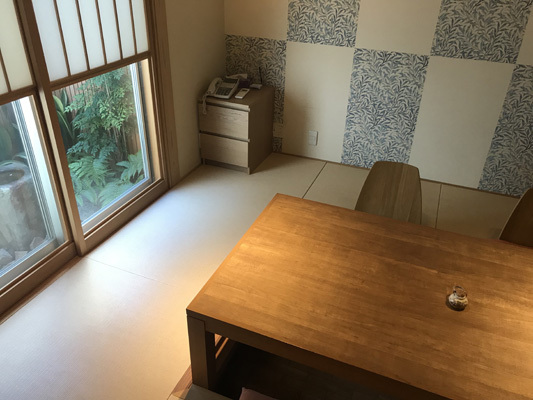 We sat on tatami mat floors in our own private room! 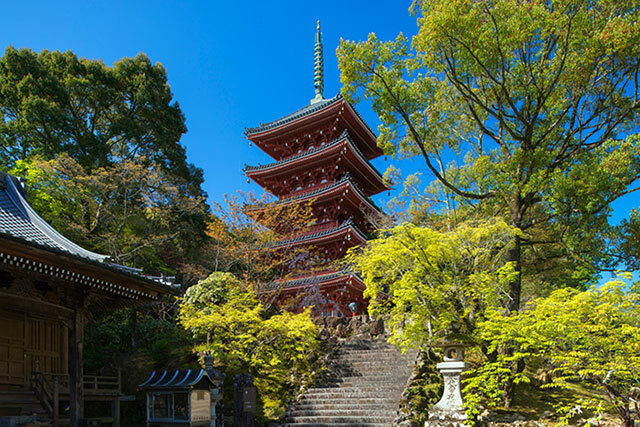 Ryozenji Temple is the first temple in a pilgrimage of 88 temples in the surrounding area. 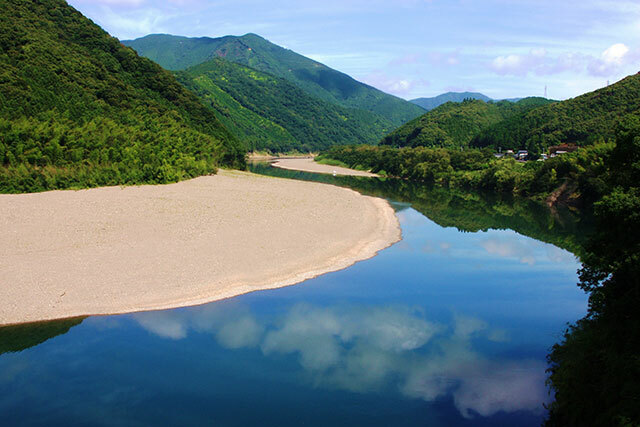 Walking this pilgrimage route can take about a month or two and measures out to around 1,400 kilometers long! 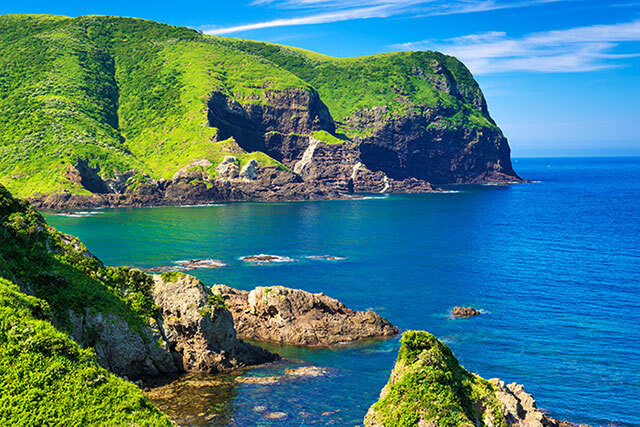 However, you can also opt to take a bus tour, which takes closer to about one week. 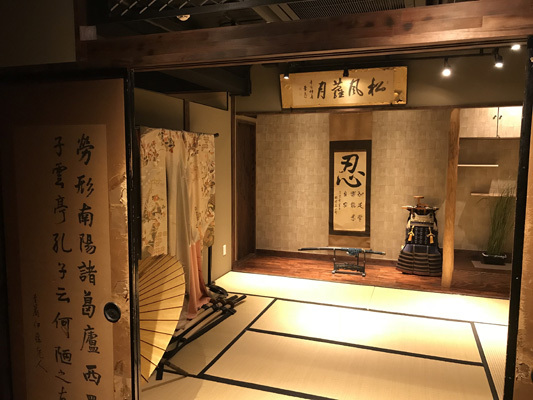 Aizumicho Historical Museum, you can understand instructions and receive handouts in English without any issues. 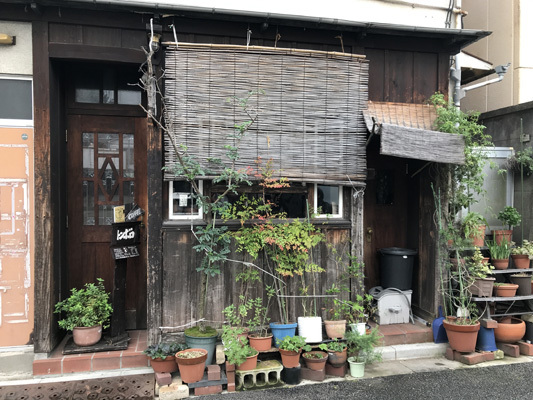 The house on the site is also over 130 years old, and is an incredible space to wander through and imagine life back then. 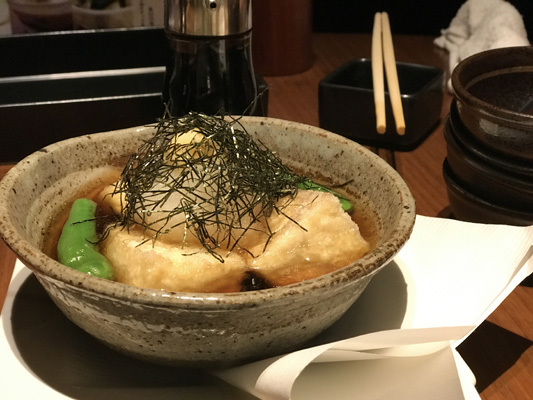 Machi Asobi is definitely a uniquely modern Japanese experience. Simply walking beside the river and looking at the flashes of costume, make up, and photoshoots occuring is a vibrant blur of pop culture. 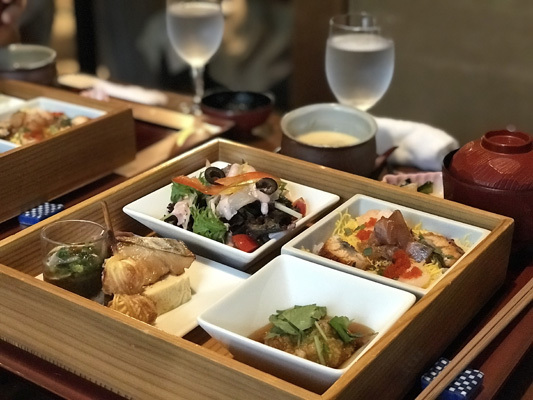 Lunch at Awa Kappo Isuzu was a treasure trove of beautiful dishes and traditional experience. 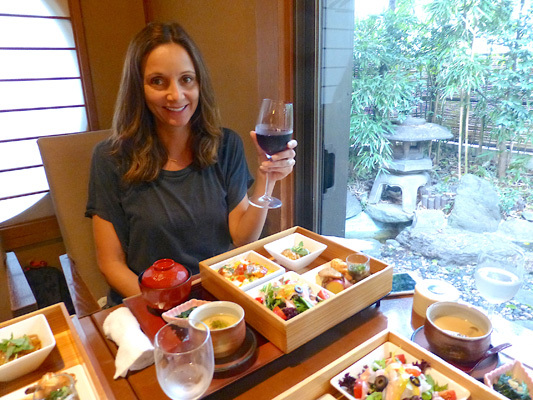 Sitting in your own private room on the tatami mat floors, you are served beautiful food. 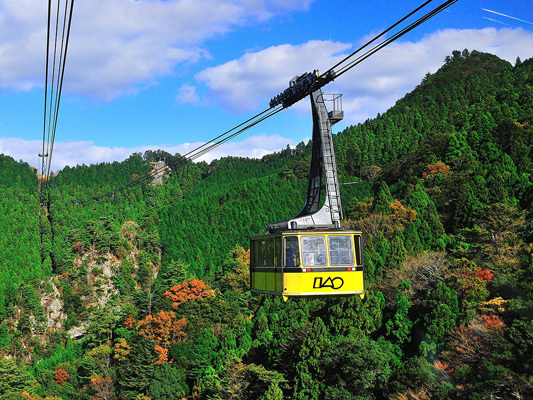 The 2,775-meter-long ropeway is the longest in western Japan and carries passengers over mountains and rivers. At the summit of Mt. 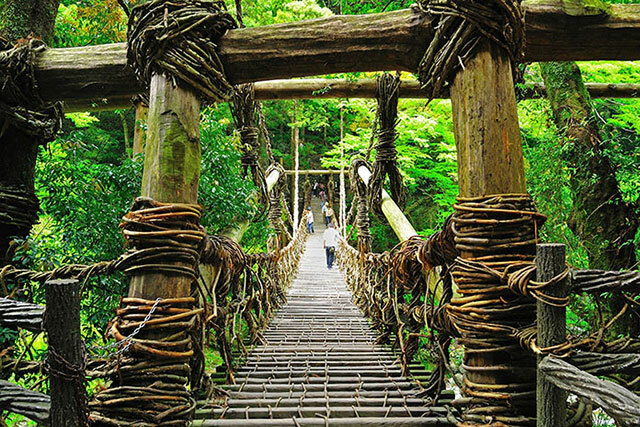 Tairyuji is a path to Tairyu-ji Temple, the 21st temple on the 88-temple Shikoku pilgrimage. 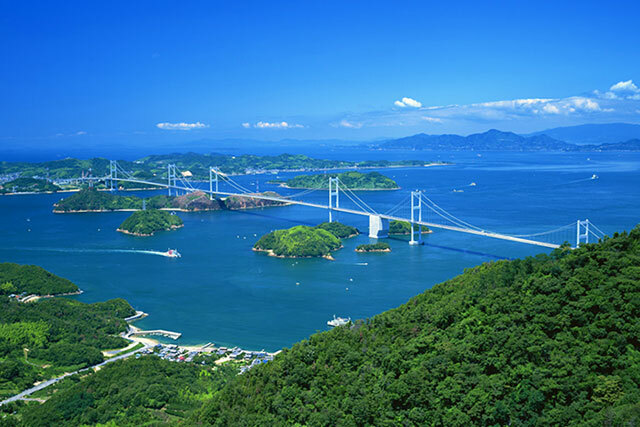 The Tairyuji ropeway gave us spectacular 360 degree views of Anan city in Tokushima as we rode it high up in the sky! 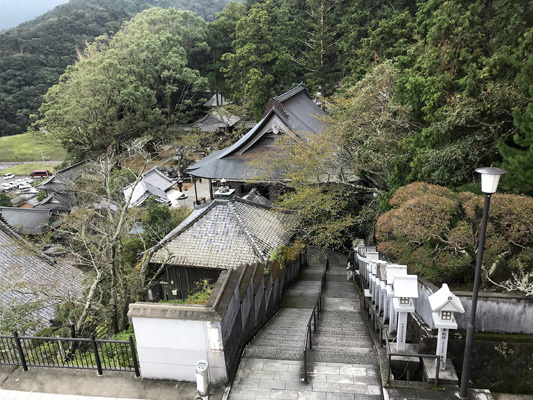 Plus, at the top we were able to explore the stunning Tairyuji temple. 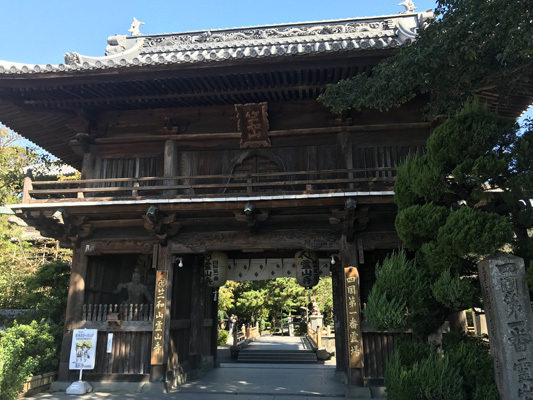 The temple is #21 on the 88 temple pilgrimage. There were 117 stairs to climb to get to the main temple, but worth every one. It was stunning! 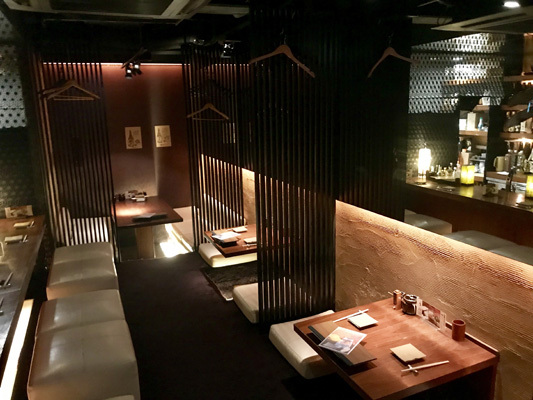 Dinner at Ichigo was held in a pretty private room with sliding shōji doors for extra seclusion. 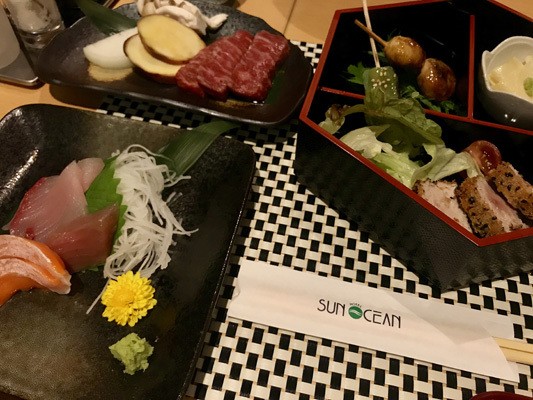 There was quite a selection of foods; seared tuna, fresh sashimi and a tender steak that we got to cook on our own personal tabletop burner. 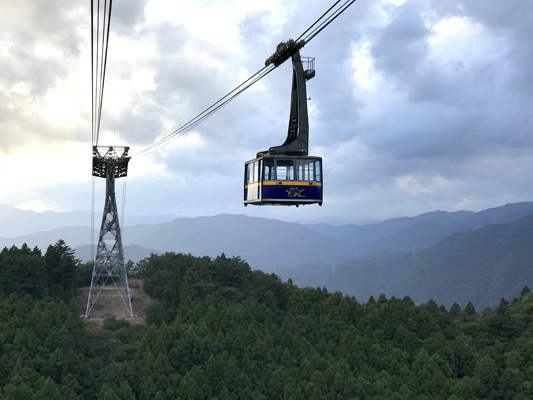 This ropeway to the Tairyuji Temple definitely offers the best view of the area. 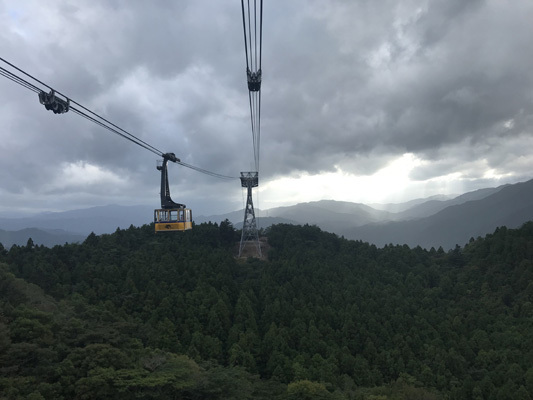 The view from the ropeway will take your breath away, and the spacious area around the temple itself seems like a peaceful dream from ancient times. 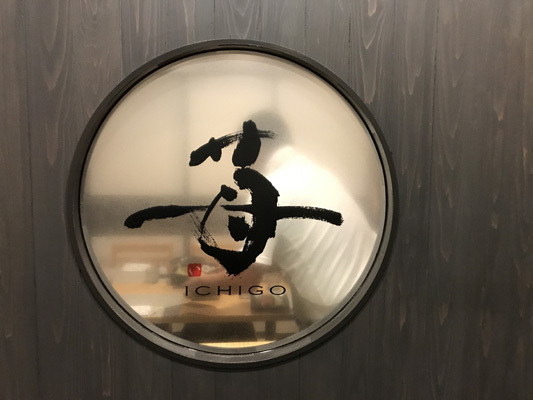 Dinner at Ichigo was possibly the best of the entire trip! Everything was very good, and you get the satisfaction of cooking some of the meal by yourself on a hot plate. 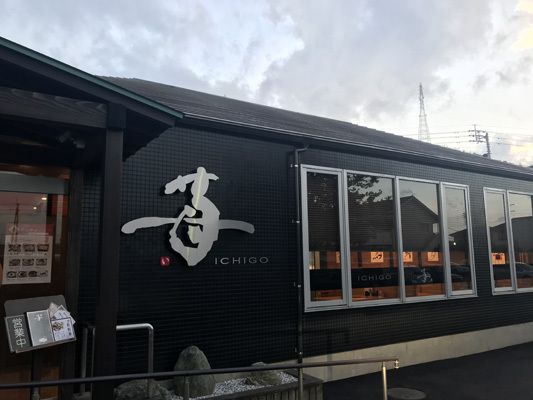 The restaurant, "Ichigo," offers very traditional Japanese meal sets as well as western style choices like pizza if you are traveling with picky eaters! My room at Hotel Sun Ocean was so cozy room and had a small bathroom that had everything I needed. For breakfast there was a choice of Japanese or European. I chose the latter of the two and got to cook my own eggs on a tabletop burner, so I could make them just like I like them! 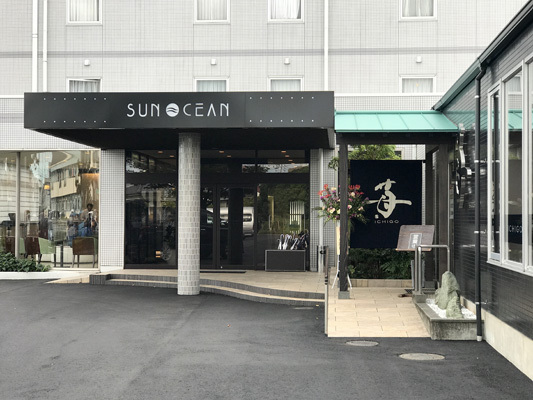 The Hotel Sun Ocean was featured a nice view from the room with all of the necessities, even a variety of tea and coffee. 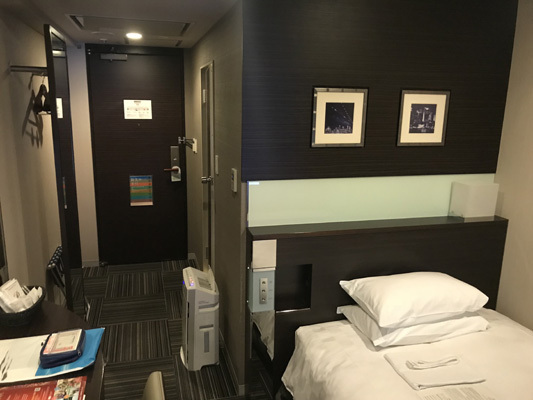 There is a private bathroom, and the hotel also has women and men’s separate baths which are incredibly relaxing if you’re comfortable with public bathing. A sauna room is also available for use in the evening. 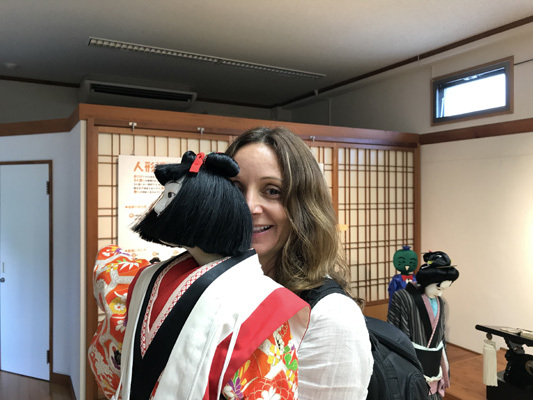 There are lots of English instructions written everywhere, and it seems like a welcoming atmosphere for foreign, as well as Japanese, guests. 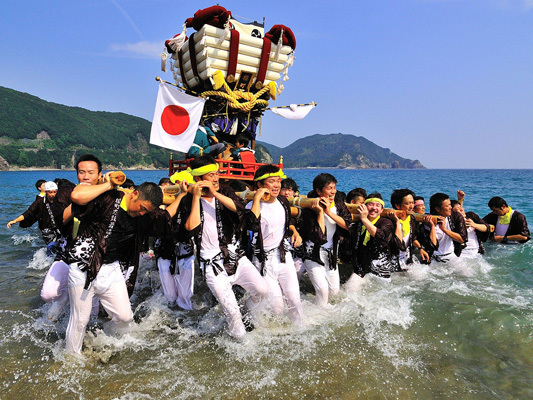 The Hiwasa Hachiman Shrine festival was a lively event where 8 portable shrines were represented. 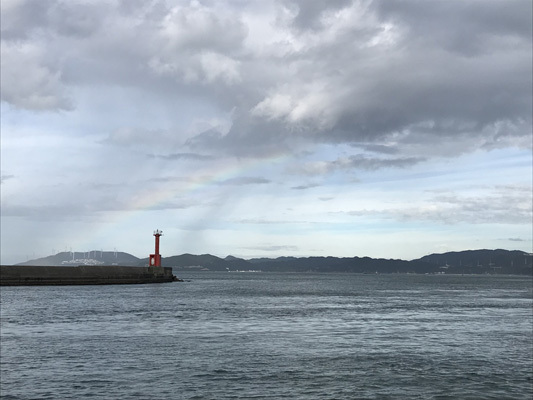 We listened to the beating of the drums and followed the parade of shrines down into the water. 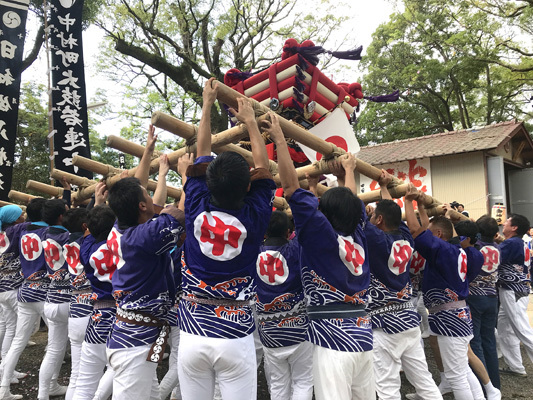 It was enlightening to be able to participate in such a traditional part of the towns culture! We also got to try some of the street food, like Takoyaki which are ball shaped snacks filled with octopus. 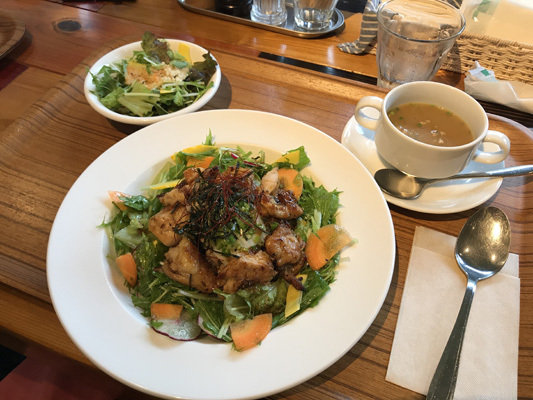 Odori was a farm to table restaurant that specializes in local chicken dishes. Inside the restaurant even had a little store section that sold some handmade goods. 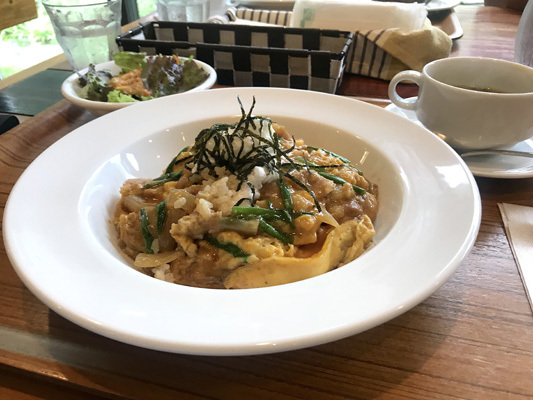 I ordered the traditional Oyakodon dish whose name means "parent-and-child" because it is made with chicken and egg. It was delicious and I can see why it is a very popular dish in Japan! 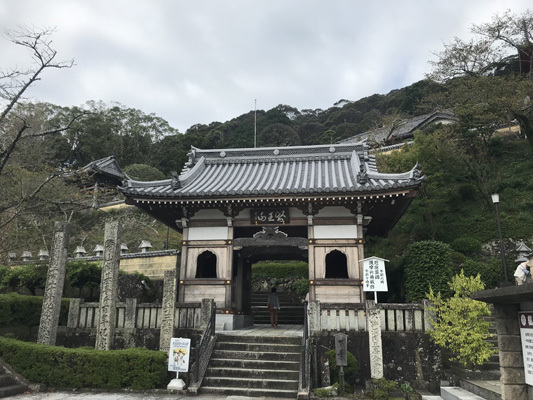 Yakuouji is temple number 23 on the pilgrimage of 88, the last of the temples in the Tokushima prefecture. 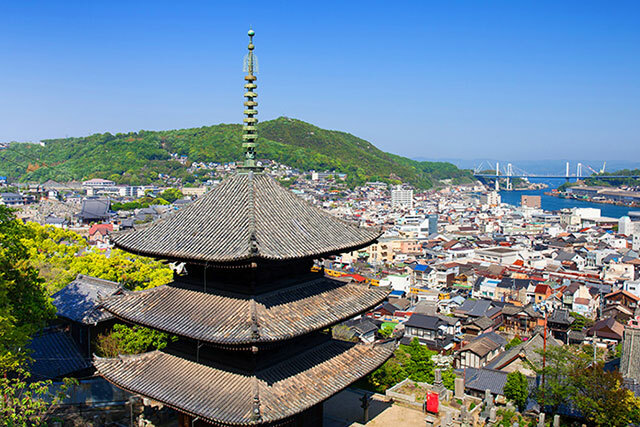 Walking up the stone stairs led us to the most beautiful view of the city and water below, plus we could see the stunning Hiwasa castle from there. 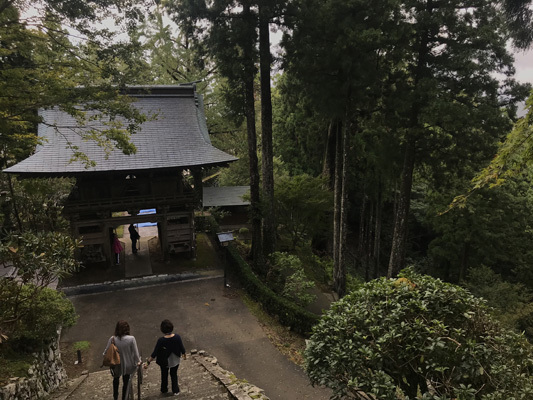 The grounds of the temple were so green, with moss was growing everywhere, and there were even a few crabs running around! 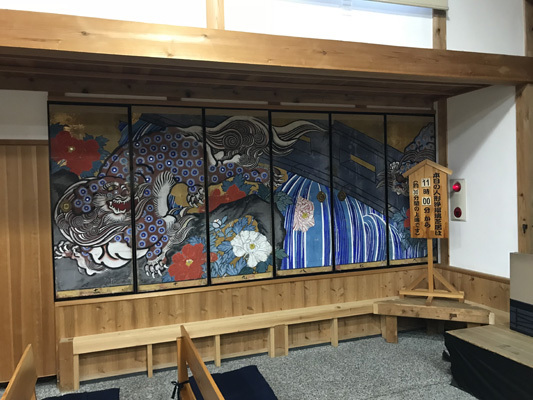 Awa Ningyo Joruri is a theater and museum based on the art of puppetry. I had no idea how much was involved in making one of these intricate puppets work. It takes three people to work just one! They gave me the opportunity to try my hand at operating one. It was very tricky trying to manipulate the eyelids, head and one arm at once, so I definitely respect the artistry. 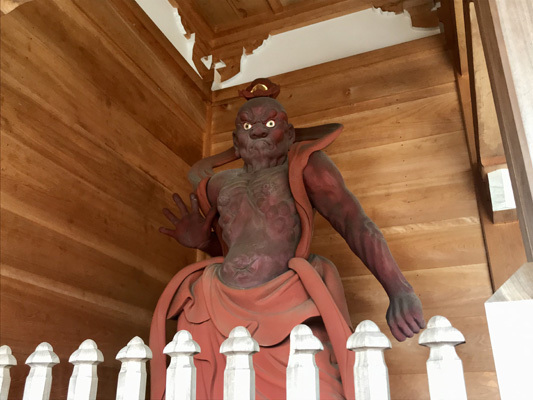 My favorite part of Hiwasa Hachiman Shrine was the two serious-looking statues in the front, who protect the grounds to ward off evil! 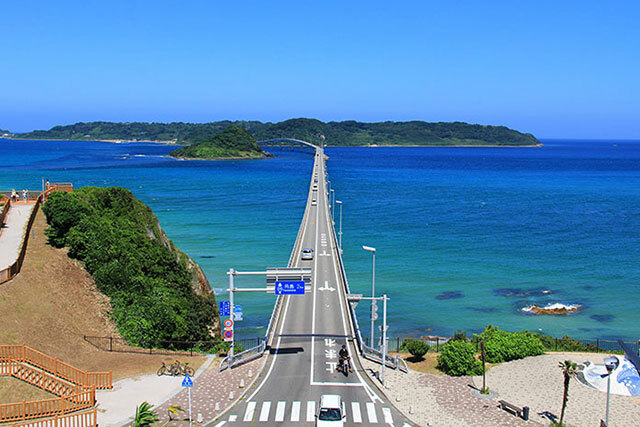 Hiwasa town which surrounds the temple is perfect for a walk through the old style streets or along the river towards the ocean. 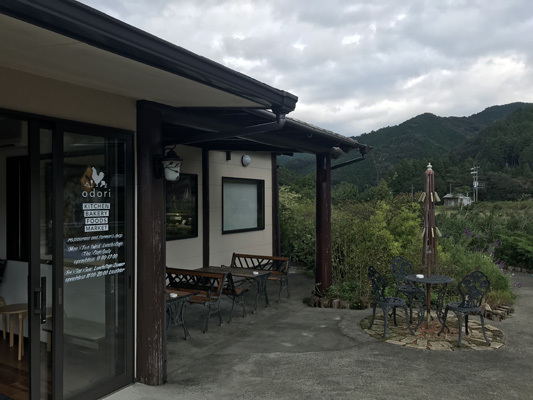 Restaurant and famer's shop "Odori" is a cute restaurant in the mountains specializes in chicken dishes, using ingredients from local farms. 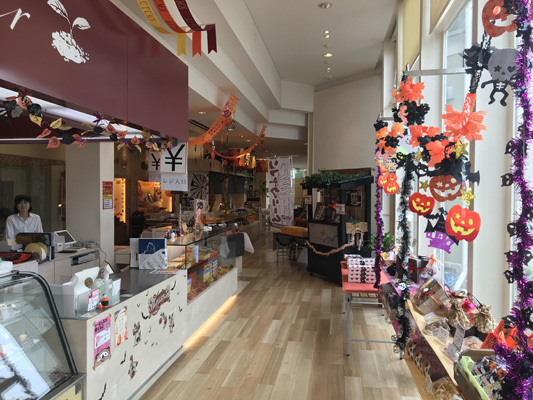 It's a great place to try various local Sudachi and Yuzu citrus fruits flavored food!! 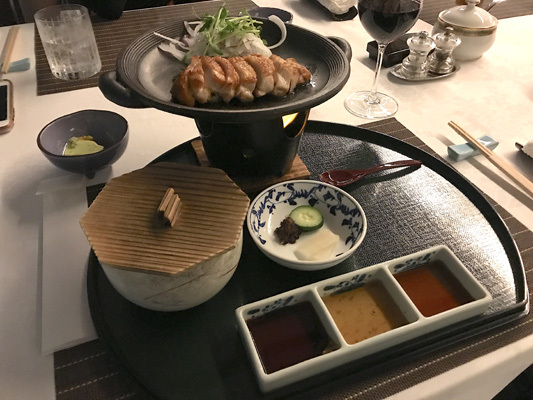 The menu choices are also a great mixture of familiar western style foods as well as traditional Japanese dishes to pick from. 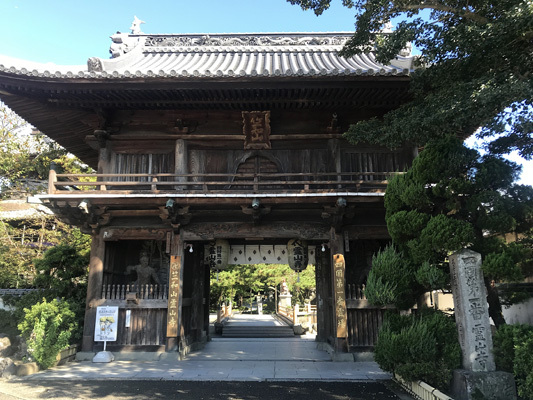 Temple No. 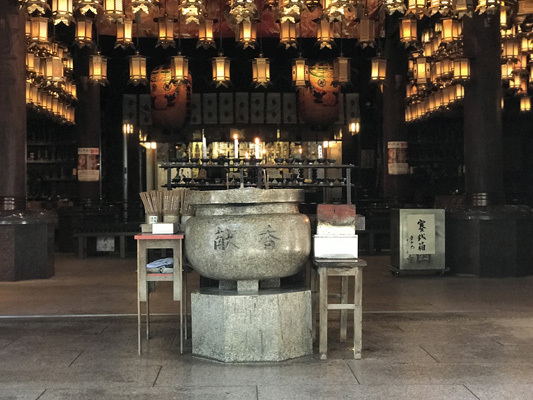 23 on the pilgrimage, Yakuoji in particular is a temple for people who seek to get rid of bad things that may seem to be following them in life. 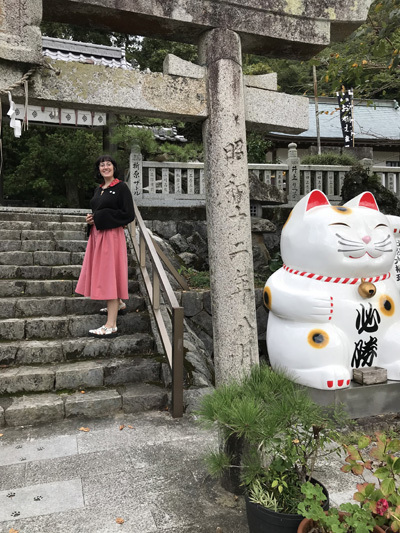 But for the non-pilgrim, this spot holds another attraction - cats! 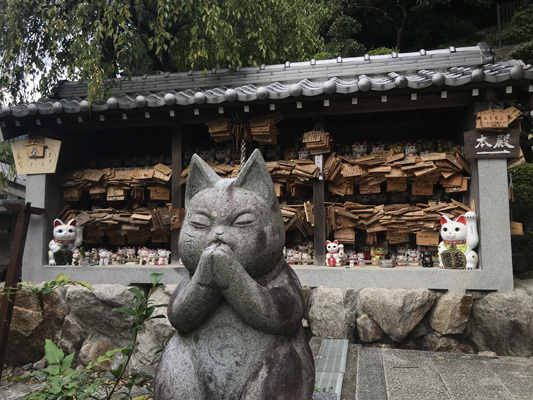 Manekineko style cat statues look onward in endless rows. Spot them sitting amongst surrounding wildlife and in crowded rows along the temple walls. Awa Jurobe Yashiki is locally famous art of puppetry dates back hundreds of years, and the dolls used are intricately beautiful. 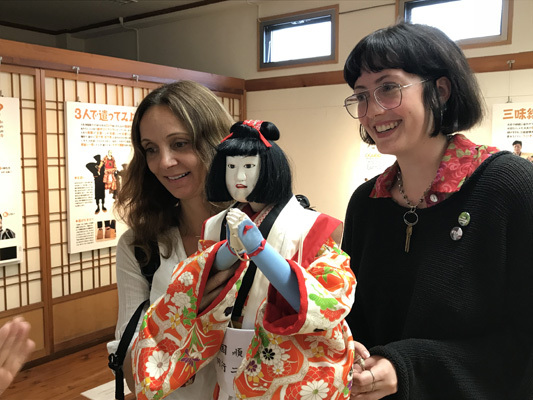 A video before entering explains the real emotions and history of puppetry in Tokushima. Later on you can even try out working a puppet yourself, which actually is more difficult than it seems! 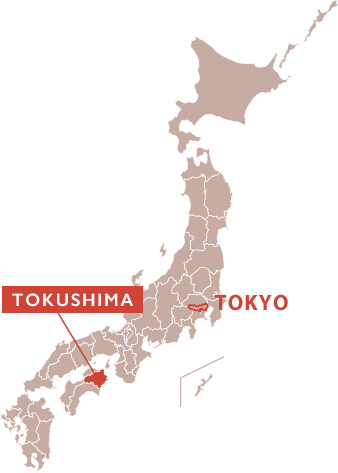 The Tokyo & Tokushima program is a great blend of modern, unique and traditional Japan. 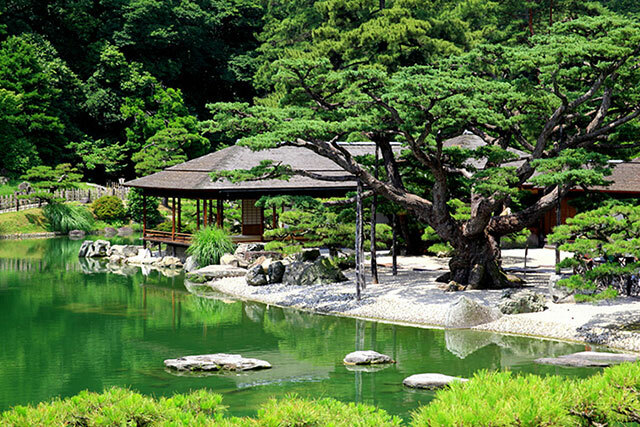 While traveling in Tokyo you feel the energy of the flashing lights and the peacefulness of a Japanese garden. 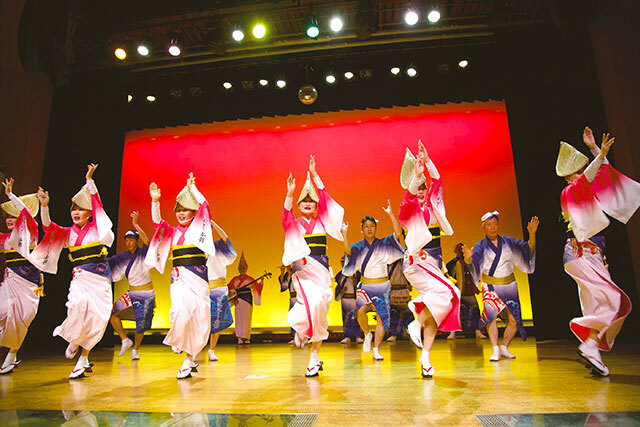 While in Tokushima you will be immersed in the culture of the Awa Odori dance, beautiful temples and Japanese food. 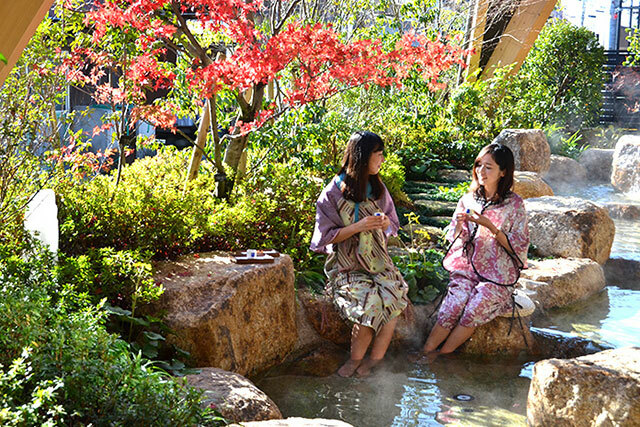 The itinerary will give you exposure to both cities, their traditions and their food culture. 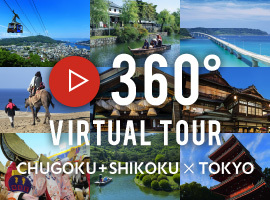 This program is a wonderful journey that guides you through both urban and rural Japan. 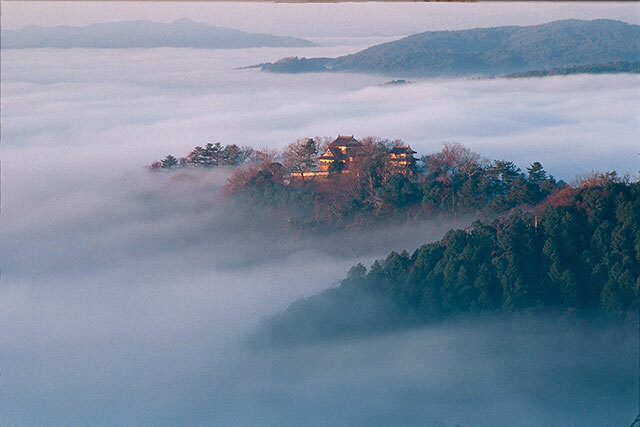 You will be exposed to many traditional experiences, such as the lively Awa Dance Festival and the serene mountain temple of Tairyuji. 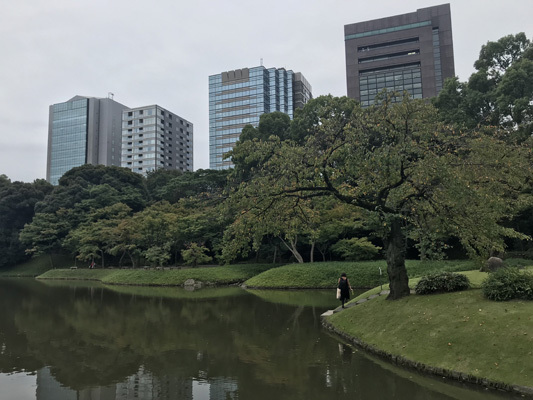 But there is also the chance to wander through the very heart of Tokyo. Along the way there is no shortage of unique customs, friendly smiles from locals, and unbelievably delicious food. 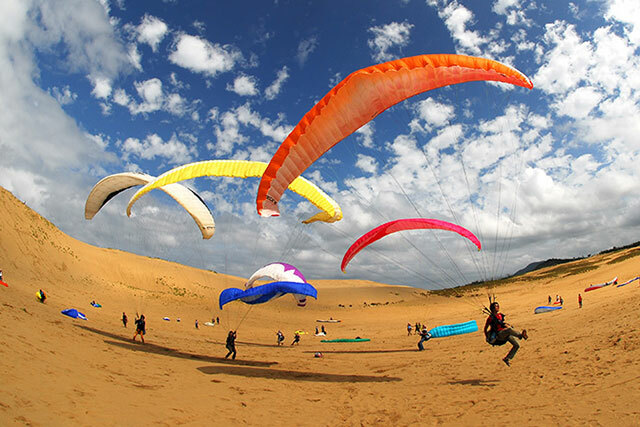 Travel,Research on food materials around the world, Canoeing, kayaking, hiking etc. Outdoor sports in general. 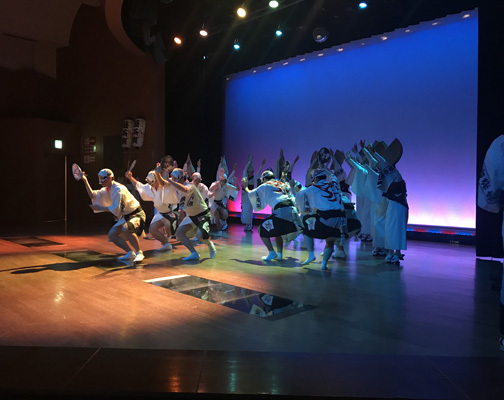 In this tour you can learn about the fesitivals and cultures in both urban and rural sides of Japan, including the famous Awa Dance Festival in Tokushima. 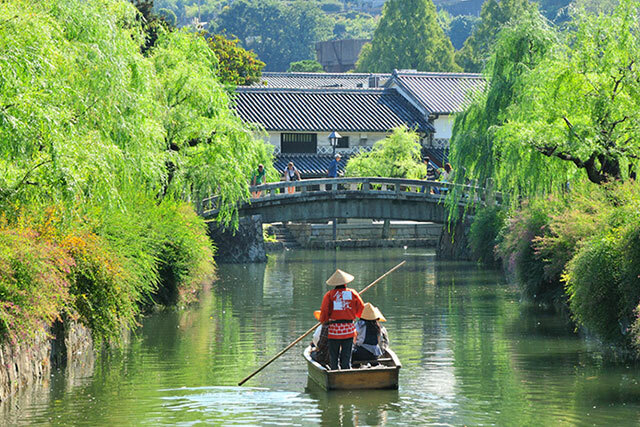 Both areas offer a blend of traditional and modern Japan, and peacefulness and liveliness. 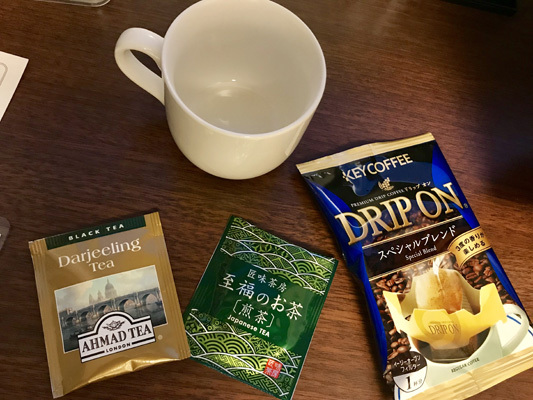 Cooking(using Japanese ingredients), I Like tea. 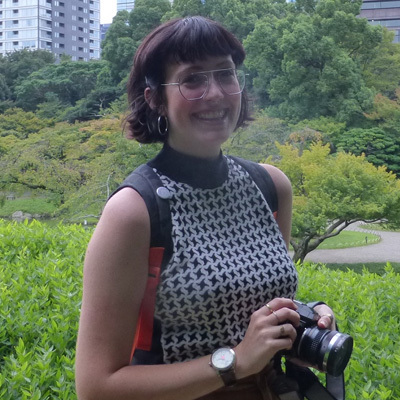 Living in Tokyo for 6 years.